So the last month has been super busy. Mainly, we’ve realized that we have about a thousand different projects going on at the same time. Starting a new thing is exciting and engaging. Then, about halfway through, it turns into work! The last few weeks, we’ve been trying to get focused on actually finishing some projects and getting them checked off the list. Even though it’s mostly little stuff (and a LOT OF PAINTING), it’s amazing how much difference each little thing makes. 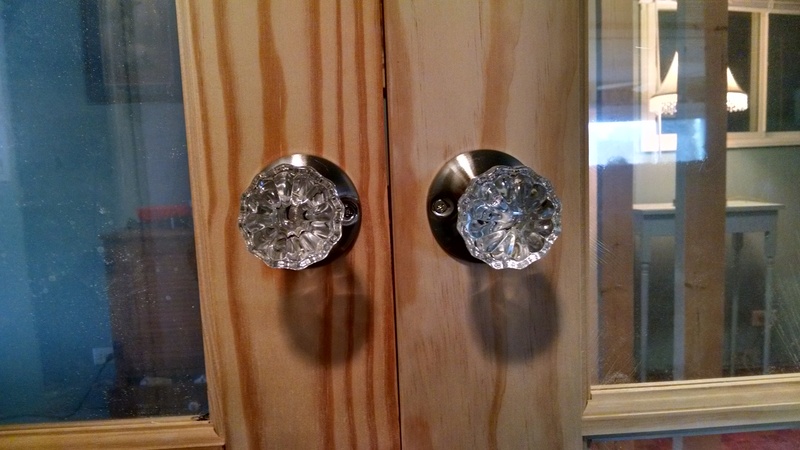 Well, the bedroom doors aren’t finished yet, but they are one step closer – door knobs!! Glass knobs for less than $8/set! They’re just dummy knobs as the doors are actually held closed with the ball spring at the top of the doors. Also, if the window panes look a little weird, it’s because they still have the factory plastic on them… still going to paint those doors soon! Close up of the knobs… I’m actually quite enamored with them. The big project that is (more or less) finished is the new bedroom wall. You may remember that we tore down a wall with the intention of rebuilding it in a different location. Standing in the bedroom looking at the new dining area. You can see the closets on the right for orientation. 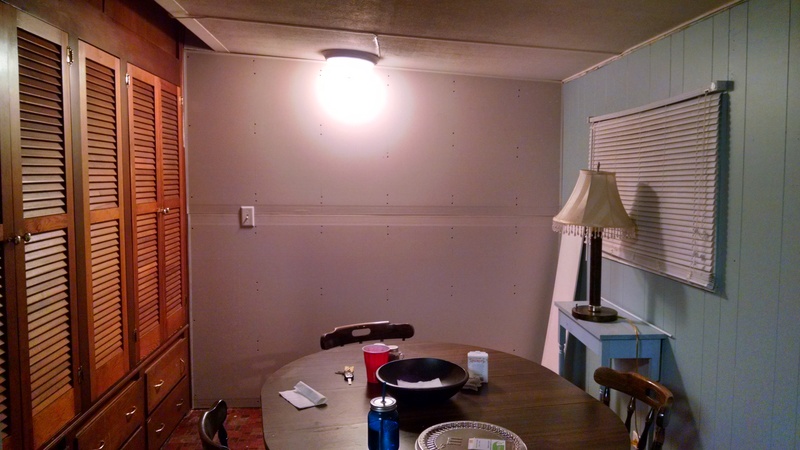 Pop hung the drywall a couple of weeks ago, which was pretty thrilling. It is now the sturdiest wall in our house. Of course, this meant more painting! 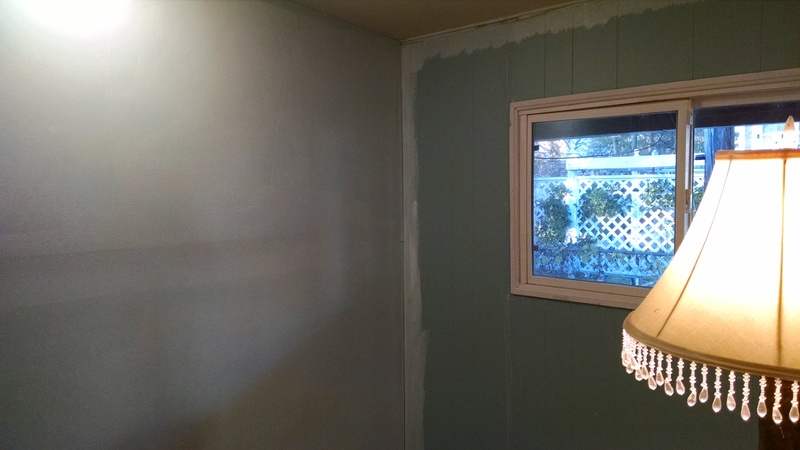 Besides painting the new wall, I also had to paint the wall on the right. 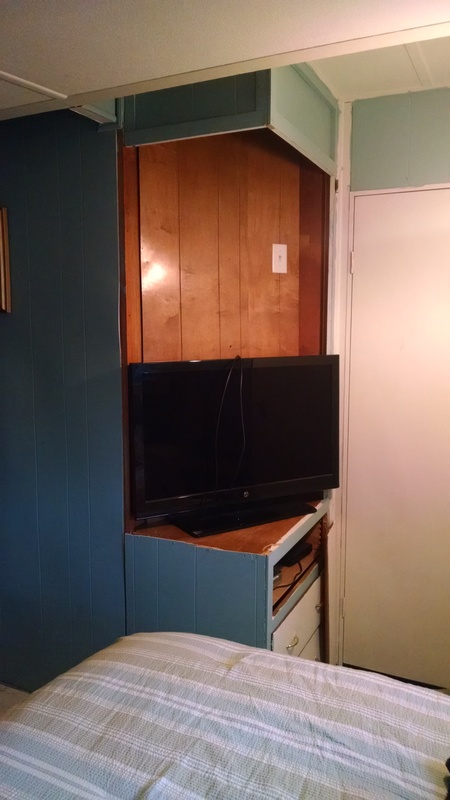 Originally, it was part of the bedroom. 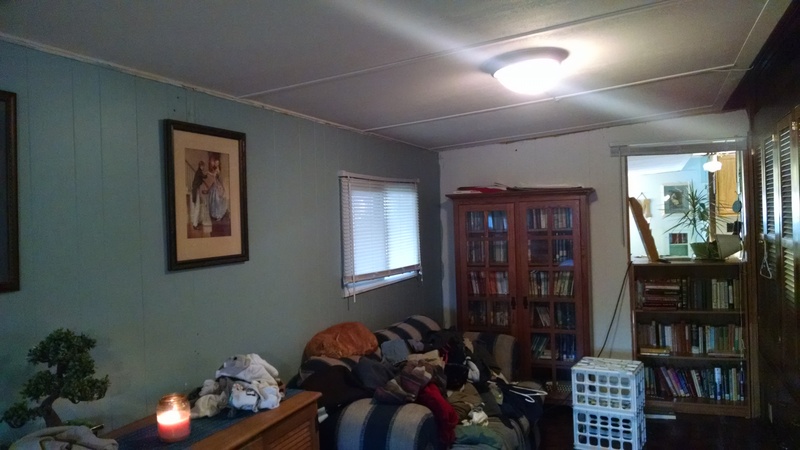 When I painted the new wall, I painted that one to match the lighter blue in the living area. 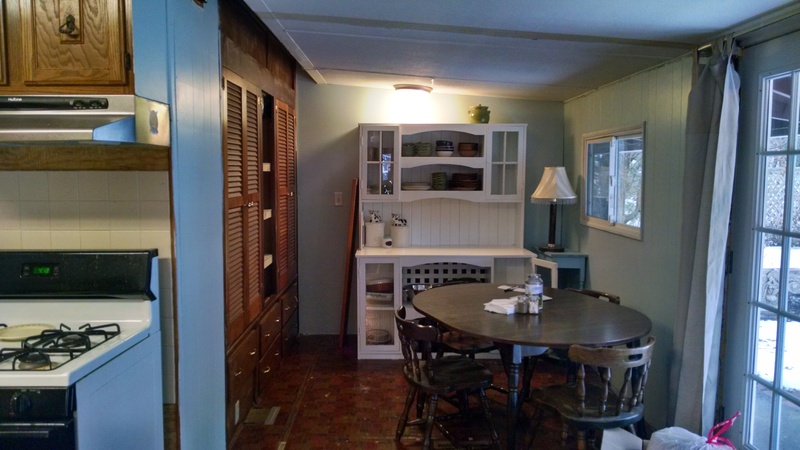 Bedroom closets or a pantry?? 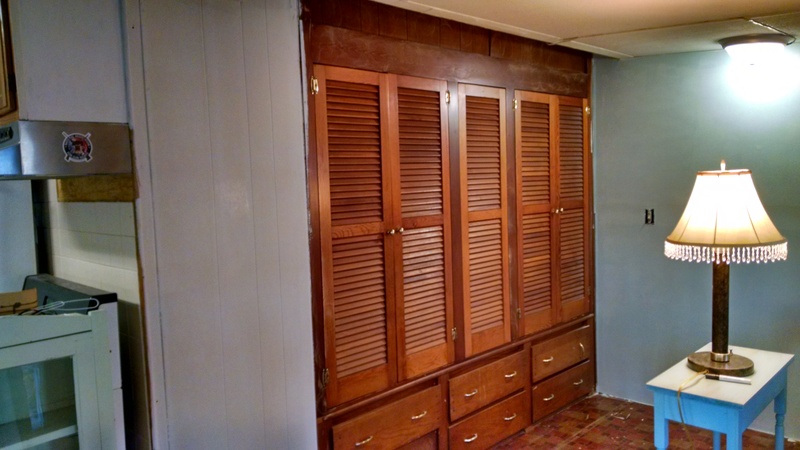 The old bedroom closets, which we’re planning to eventually paint white, are now turning into our main pantry area. 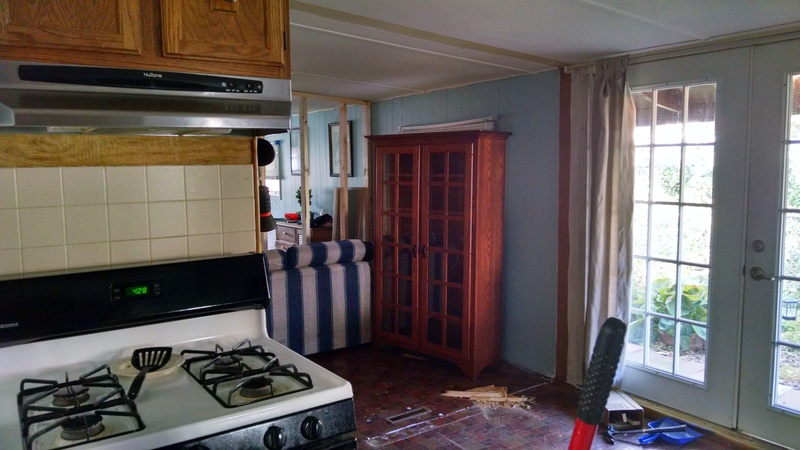 The doors to the left are pantry, and the section in the middle is being turned into a door, also with shelves inside. 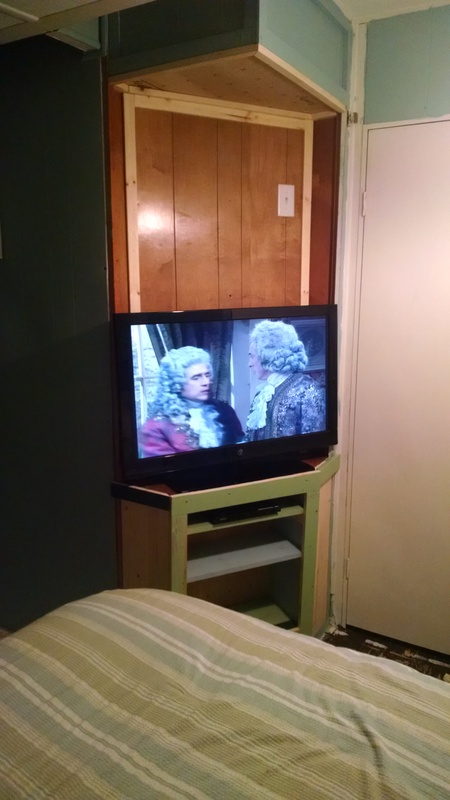 The left side is now the coat closet (we just made that decision two days ago… this place is in constant flux!). 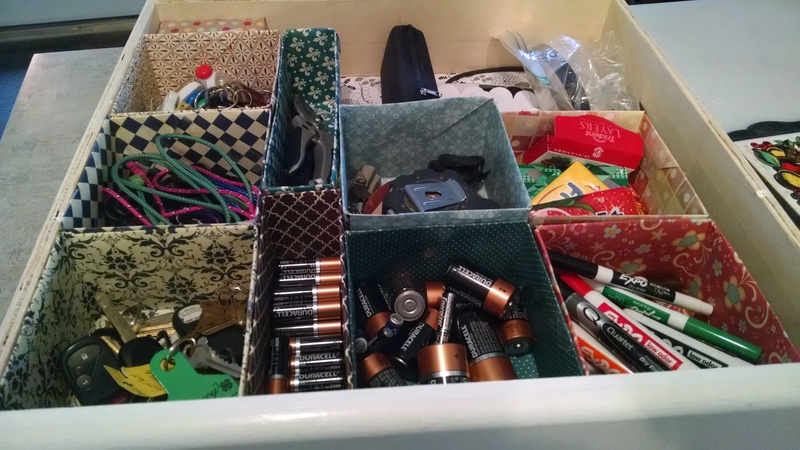 We aren’t sure what we’re doing with the rather bedraggled drawers along the bottom. 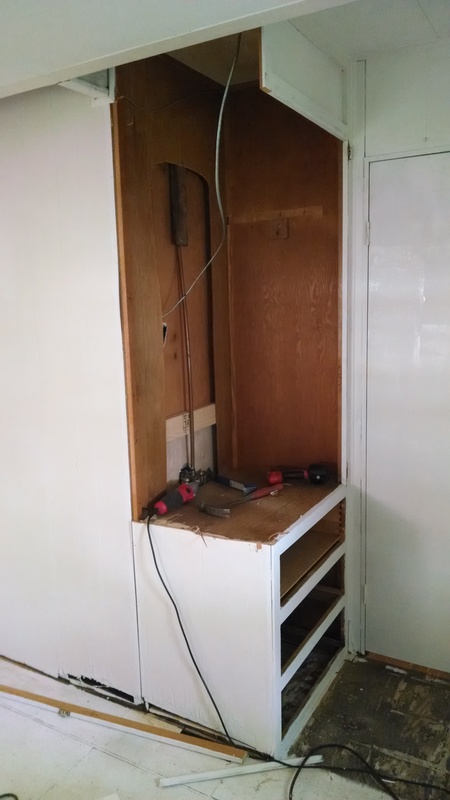 I think that some of that area will probably be made into cubbies for shoes, but we may just fix up the drawers a bit and keep them. Currently, I’m using them for spare linens and blankets. Someday, I may actually have a linen closet for that kind of thing. 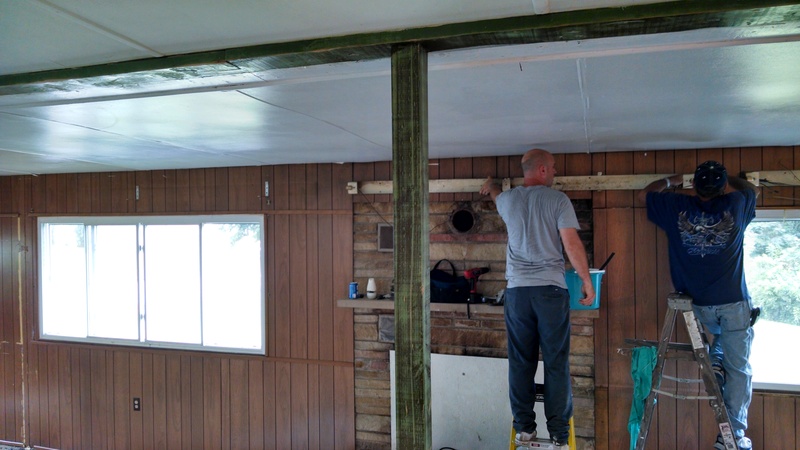 While the wall was an ongoing project, Tom has also been working on a fun project that he’s had in his head for quite some time – organizing the barn. Our barn is super old, and actually (according to the unofficial town historian, an old guy who lives around the corner) stood originally where our house is now. At some point, the barn got dragged down the hill and our beautiful trailer took its place. Several years ago the previous owner had the barn sided with aluminum siding. 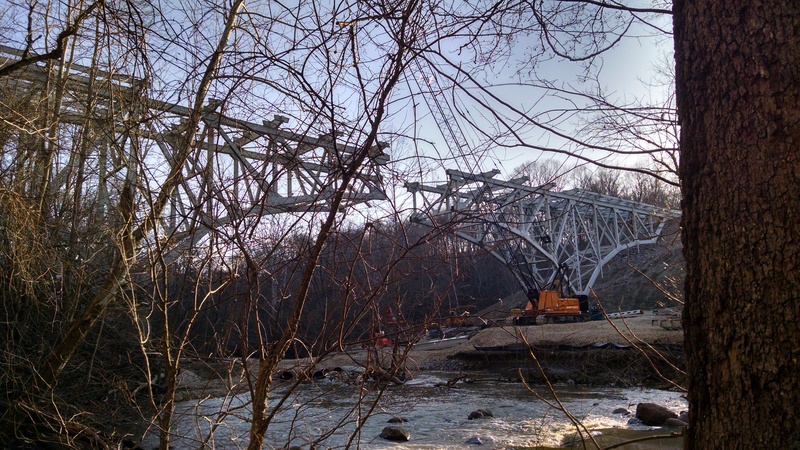 At that time, he also shored up some beams and that sort of thing. Overall, it’s fairly sturdy, although the electric is 100% sketchy. We are planning to rewire the whole thing next spring. 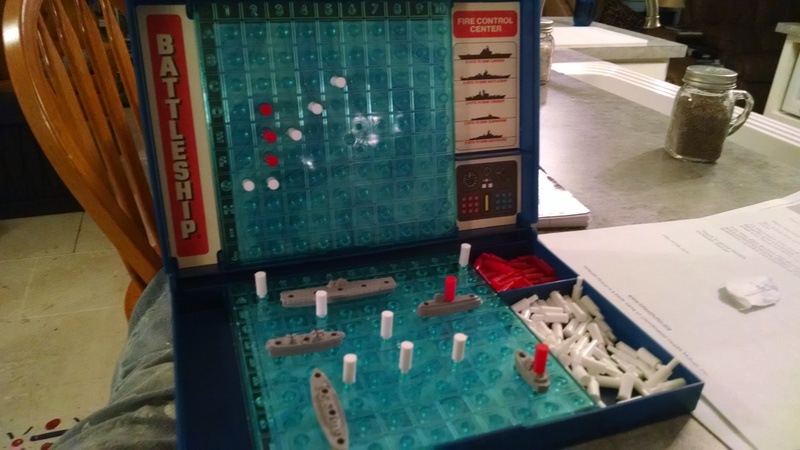 In the meantime, we turn off the fuse when we aren’t down there! 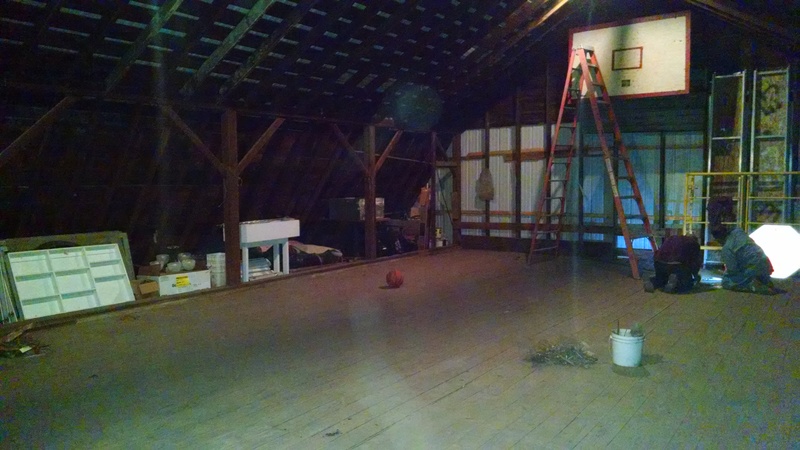 Anyway, it’s actually a pretty spacious barn, and it has a full loft, too. Downstairs, Tom has set up a workshop area with space for both of the cars (as long as you plan ahead as to which one you want out of the barn first!). Upstairs, we’ve created a rec room of sorts, and it’s actually come together way better than we imagined. 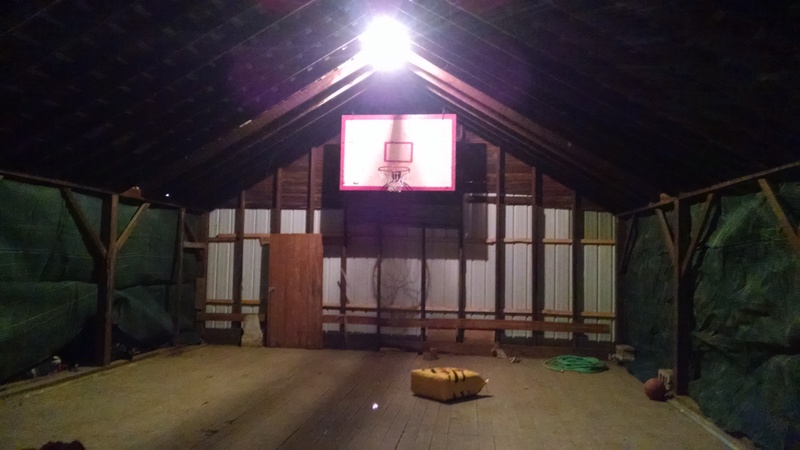 When Pop was a kid, he and his friends used to play basketball in the upstairs of the barn, and the old backboards were still there. We decided to set up a half-court, and bought and installed a rim accordingly. I have no idea where Pop got his ridiculously tall ladder. After we got the hoop up and realized it was awesome, we decided to add an old pool table that was in Pop’s garage. It was originally Tom’s; actually, it was in his entry room when I first met him. When we got married, though, we had way too much furniture (a problem we still have, honestly), and the pool table was relegated to Pop’s. 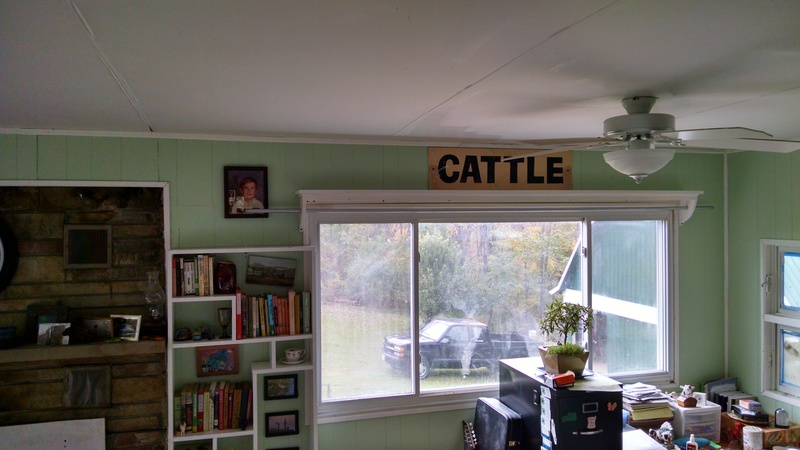 Now it’s the perfect addition to the barn, except I don’t have a picture of it. We put up a dart board, and I found some old sheets at Salvation Army to put over some indoor/outdoor furniture that Tom’s mom gave us a while back. Finally, Pop found some old netting in his barn that we put along the sides to keep balls and darts from flying into the storage under the eaves. Our new hang out spot. This is before it was really cleaned up. That yellow target is now set up in the left corner, surrounded by straw bales, for Tom’s archery practice. I’m standing where the pool table is, and the dart board is to the left. It’s pretty awesome, really. Of course, the weather has turned bitterly cold, but before that we spent several evenings chillaxin in the barn. 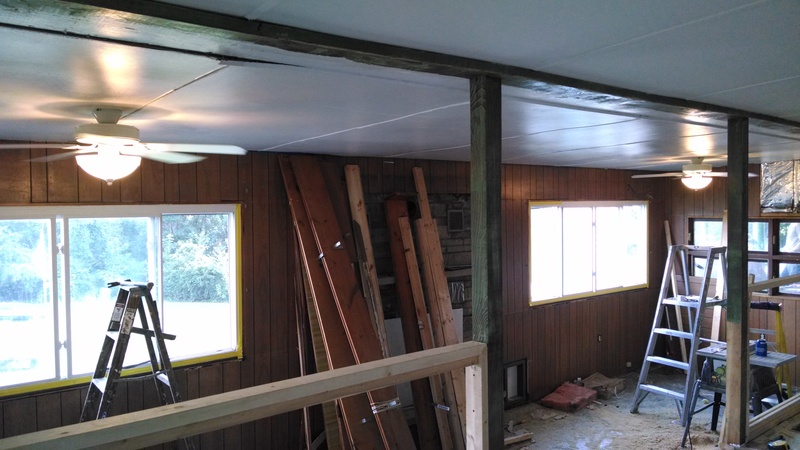 Next year, we’re going to cut some of the siding away to make windows, because that loft gets H O T in the summer. One big complaint I’ve had about this place is that we took out almost all the closets, so storage has been somewhat of a hassle for me. We’ve slowly been building back in shelves and such, so it’s coming together. Recently, I was super excited to get some shelves in our tiny weird back bathroom. We’ve never used this half bath because the toilet leaks. Eventually, that area will be combined with the actual bathroom and some of the laundry room to make one bathroom of awesomeness, but for now I’m super (SUPER) excited to get some shelves back there and start getting some stuff put away! But now it is a closet with shelves and I am SUPER happy! 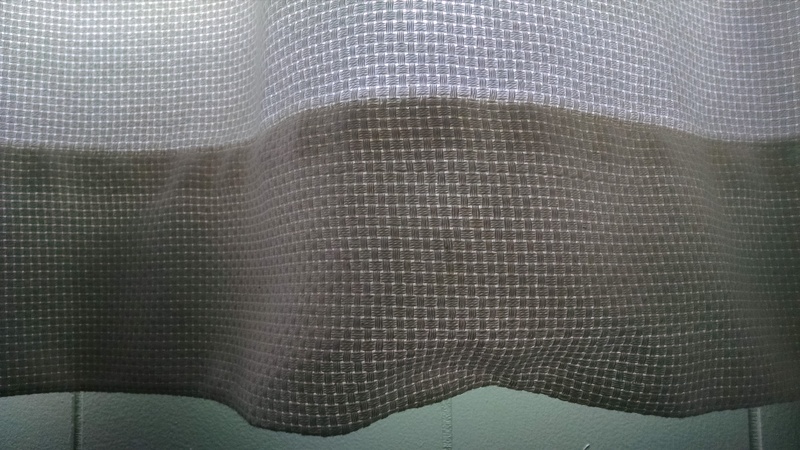 Another project that’s taken a huge step forward – CURTAINS. In the lower room, we have four huge windows – the ones on the ends are 7′ across, while the two facing the barn are 8′ across. While the one end window is what technically faces the road, anyone driving up the road – and a lot of people do, because it’s a state route – can see in those two 8′ windows the whole way up the hill from the gas station. Now that it’s dark at 2:00 in the afternoon (practically), we were really excited to get curtains up on those two windows. Originally, we were going to try to put together dowel rods, but the longest we could find were exactly 8′, and we couldn’t come up with a good way to stick them together. In the end, we went with conduit instead. At about $4 for 10′, it was hard to beat the price. 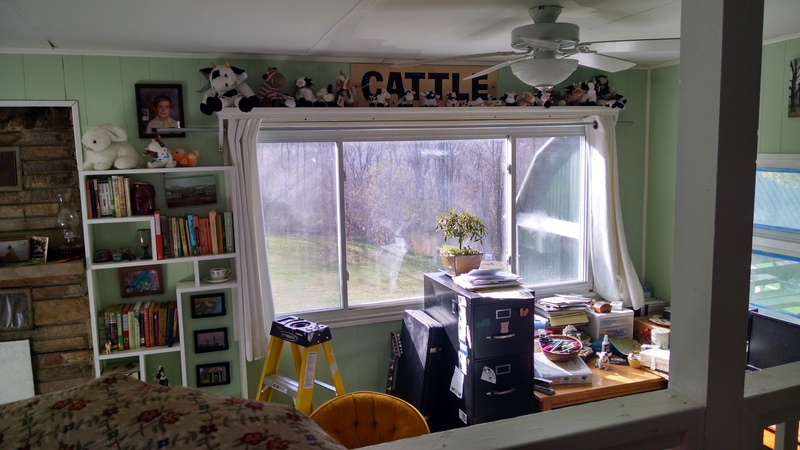 Tom built some fancy shelves to hold them, and my grandma did an AMAZING job making the actual curtains. Here is one of the window shelf/curtain rod holders. Because these windows open on the sides, it was really important to us to have a system wherein the curtains could fold tightly. Thanks to Grandma’s expertise, she was able to design them perfectly. She used a fabric called monks’ cloth, a sort of woven cotton. I really love it because it’s light, yet heavy enough that people can’t see through it. Plus, even though it’s plain, it’s not completely plain. I’ve ordered curtains for the bedroom and laundry room. 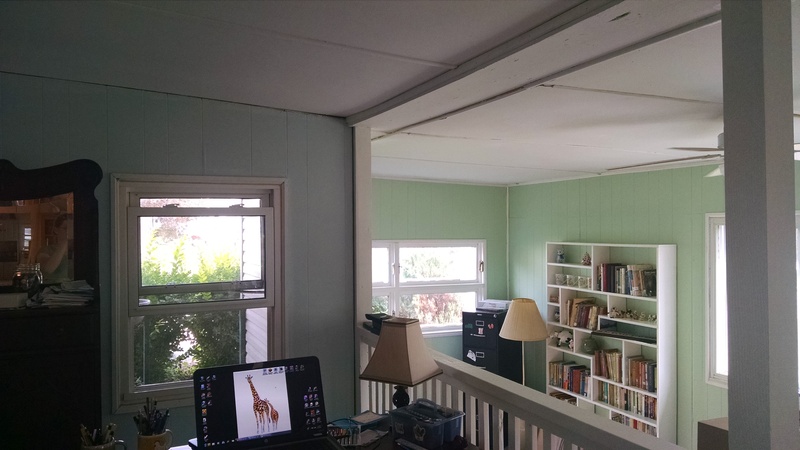 All the windows in this house are weird sizes, but the four windows in those two rooms are at least all the same weird size, and all of them will work with kitchen curtains (they’re very short windows). I’m not sure yet what I’m going to do with the living room windows. Grandma made the curtains for the two long end windows; hopefully we’ll get the curtain rods up this weekend for those. There are five more windows on the upper level, plus two sets of French doors. That’s a lot of curtains, and it’s a lot of curtains for weird sizes – short, fat windows that aren’t quite short enough to use the kitchen curtains I got for the bedroom. Ah well, one problem at a time! 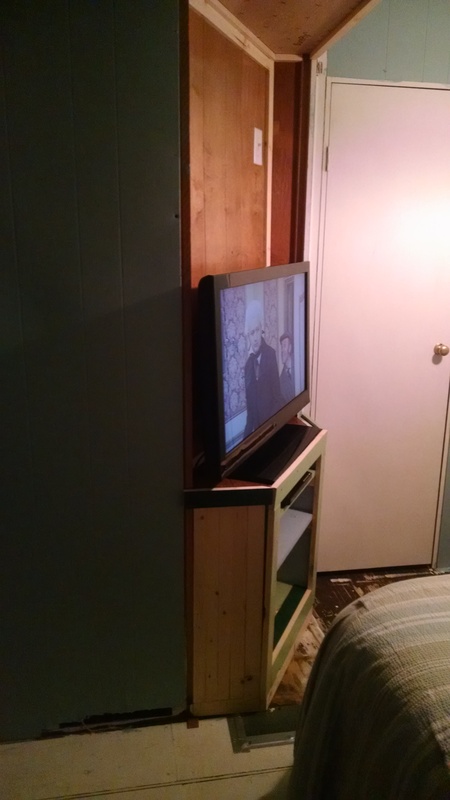 Tom’s still been working on the little tv corner in the bedroom. 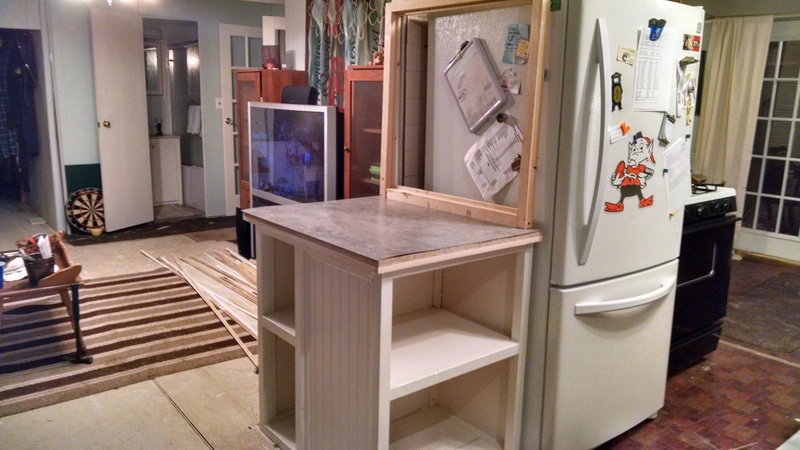 It’s evolved quite a bit from the beginning, when it was a weird shelfy-closet thing. Tom started by taking out the closet part in the top. 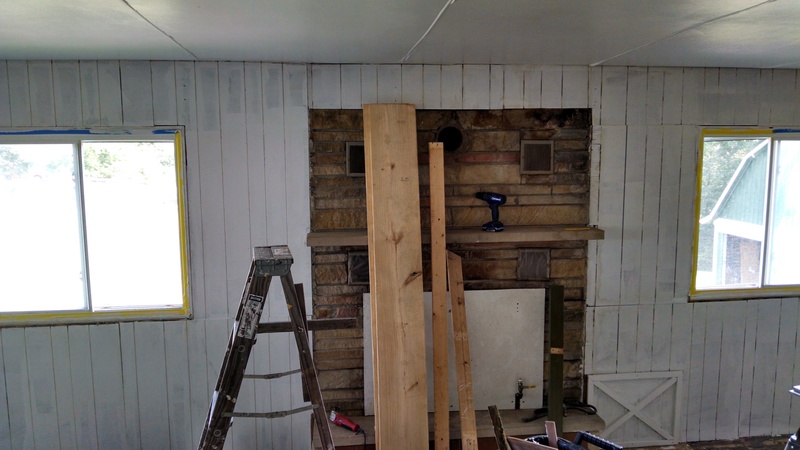 A few weeks ago, Pop finished the back wall, complete with a working light switch and outlet! Last weekend, Tom took out the drawers and angled the whole shelf. Now there’s more room for me to walk past the corner of the bed. Of course, the bottom is going to get painted white. And yes, we had some Monty Python playing. See how much skinnier it is?? Yes, that’s a real plant. If it gets much bigger, I’m going to have to donate it to the Conservatory. 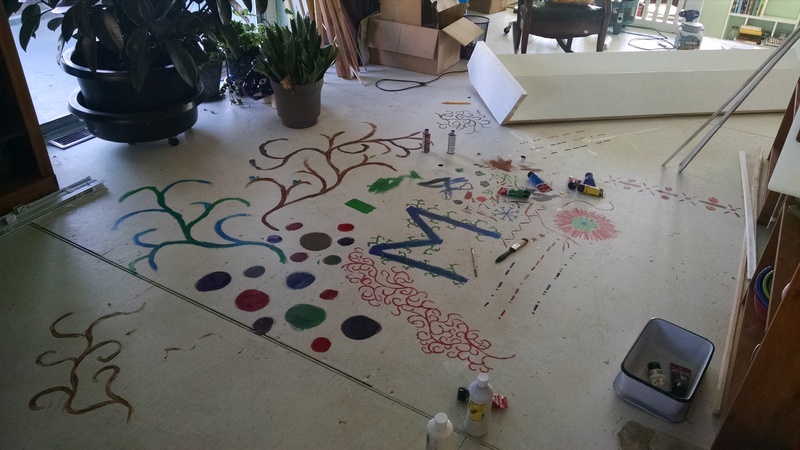 And the other day I was able to practice some possible designs for the stairs… right on the floor. My doodling sort of devolved… and I’m still not sure what I’m doing on the stairs! The stairs, which are in the top of that picture, are now white. I painted them with glossy porch & floor paint in the same white that we’ve been painting all the trim. We’ll see how it holds up. I didn’t get a picture of them installed, but they are back in place and looking very nice in white. I’m thinking about painting a design similar to the one that’s in red – the viney one in the middle of the picture there – but I’m not sure yet. Well, that is plenty of updates for now! Maybe I should try blogging more than once a month! 😀 Things really are coming along. It’s so much fun to see things fall into place – and it’s also fun to be able to change things on the fly. 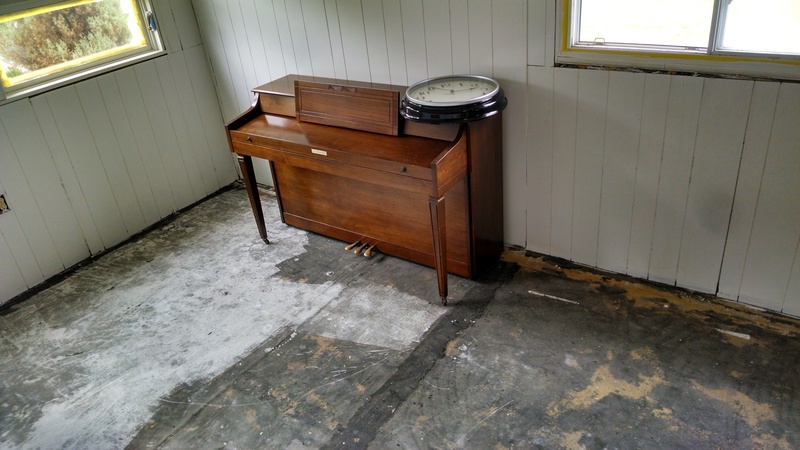 While it would be awesome to have a super nifty old house to restore, there’s a certain freedom that comes from fixing up something that it doesn’t really matter if it gets completely messed up! 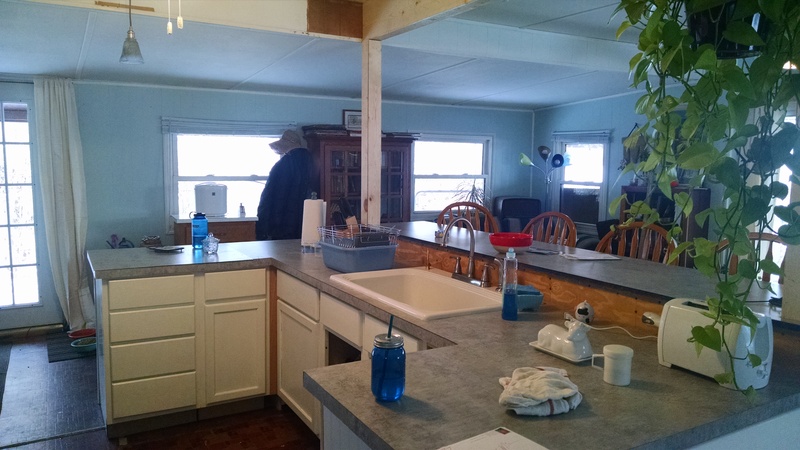 Oh, oh, and I almost forgot – we got the hutch painted, too, and today I put dishes back in it, and I’ll leave you with this final picture of our little dining area which really is starting to look quite happy! This area is so much better as a dining nook than a bedroom! Okay, so, updates. First off, last weekend we spent some time looking at doors and trying to decide what we wanted to do with the bedroom doorway. It has been a weird doorway because originally only the left-side door actually went into the bedroom, from the weird tunnel hallway that no longer exists. 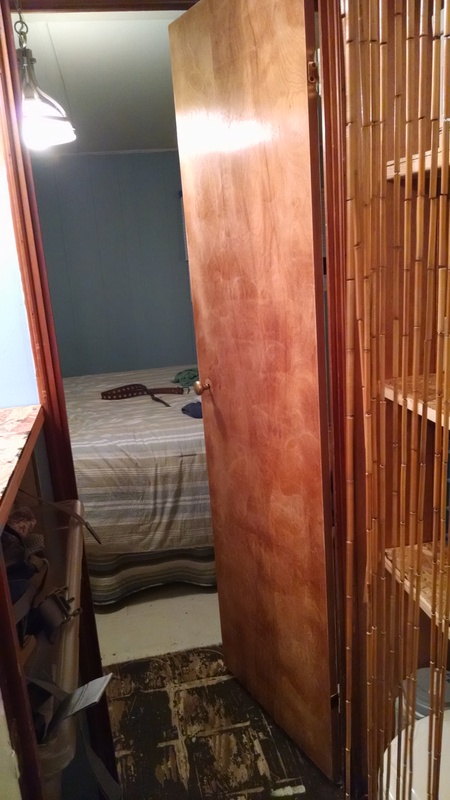 The right-hand door was actually into a closet that also no longer exists. That left us with a weird-sized doorway, as both doors are narrow trailer doors. Plus, we had that lovely post in the middle of everything. Originally, we talked about making the doorway just regular-door width, which would mean filling in the wall a bit on either side of the door. But when we were at Home Depot last weekend we found doors we fell in love with – our dream plan was to put French doors in this doorway (now that it’s a one-bedroom house, it just doesn’t seem to matter if that single bedroom has doors with windows), and Home Depot had these perfect doors on sale for only $37 each!!! 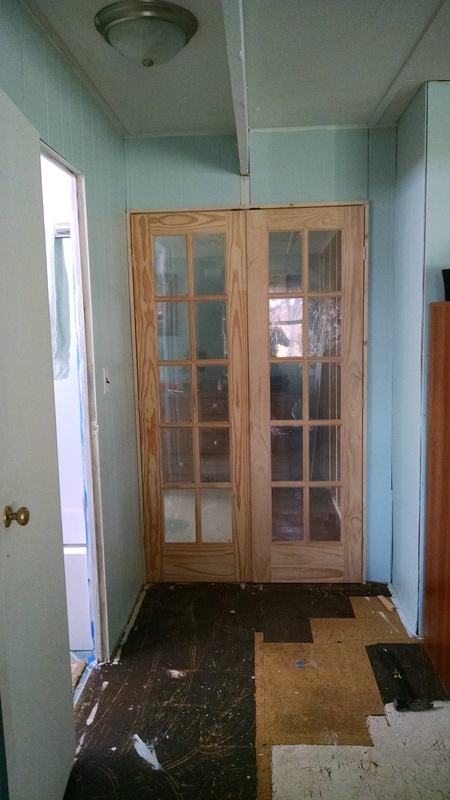 Of course, we’ve always been told to never buy doors that aren’t pre-hung. 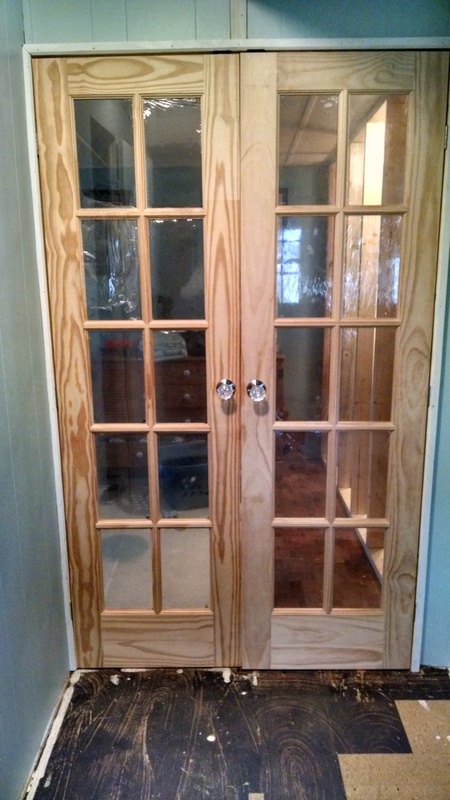 We came home and chatted with Pop about what kind of work would be involved in hanging the doors ourselves, since getting a pair of these doors in a pre-hung doorway was $275. He seemed (of course) confident, so we went with the doors. 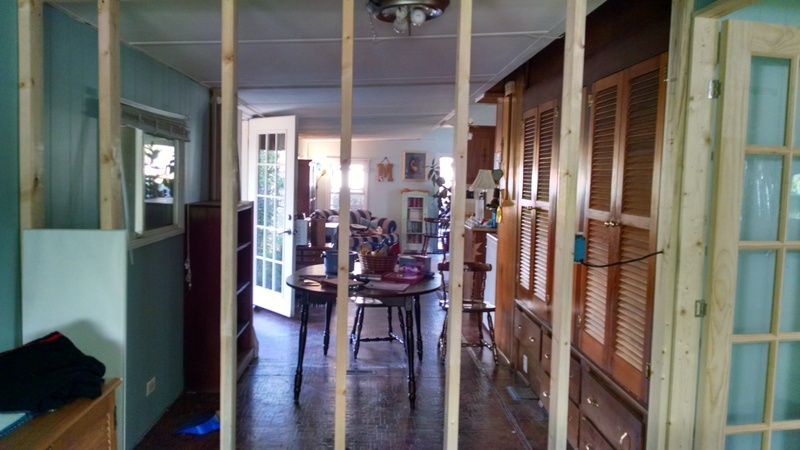 Big project #2 for this week was demolishing one wall and building another. Remember this picture from last week? Someday I’ll learn to tidy first, then take pictures to post on the internet. 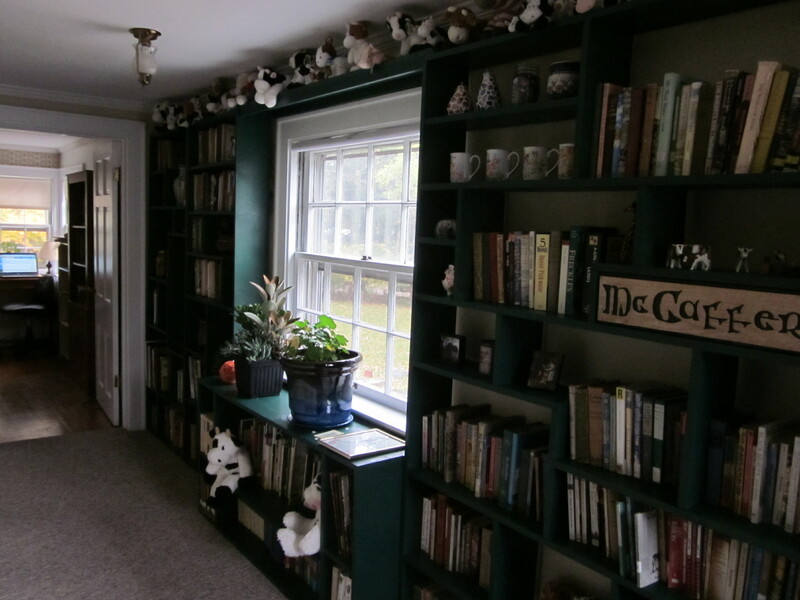 The wall you see straight ahead, with the bookshelves in the doorway, was scheduled for demolition. Taking the picture, I’m standing at the foot of our bed. We decided to make that end of this unnecessarily long, skinny bedroom, part of the kitchen instead. 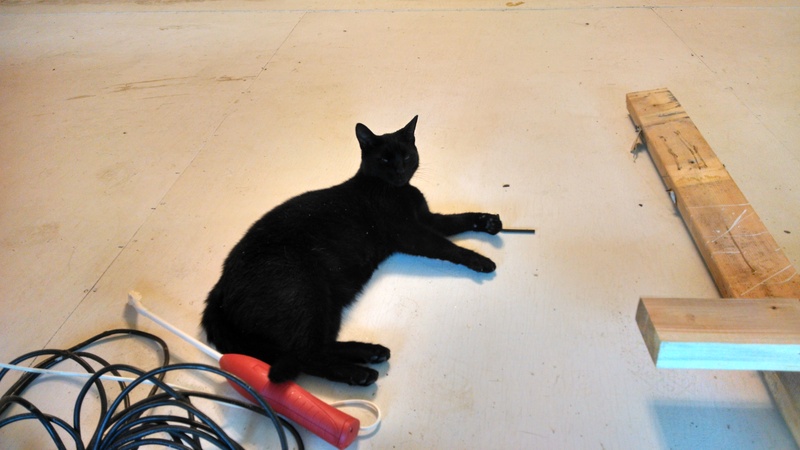 On Thursday, the changes weren’t as dramatic, but they were still nice – electrical work! New outlets all along one wall (since the old ones were faulty and not grounded), plus wiring for our new little tv stand in the bedroom. A working light switch, too! Anyway, the doors got hung!!!! Now they just need painted and the hardware – actually, I got these perfect glass doorknobs that I’m super excited about. They’ll be dummy knobs since we used a ball-catch at the top of each door to keep the doors closed. There’s still some finish work, mostly trimming in and building the back stop to keep the doors from swinging too far backwards, plus the hardware, but definite forward progress on that project!!! While Pop was focused on the doors, Tom was working on wall demolishing. Every single time we’ve removed a wall around here, it’s been the right thing to do, and today was no exception. 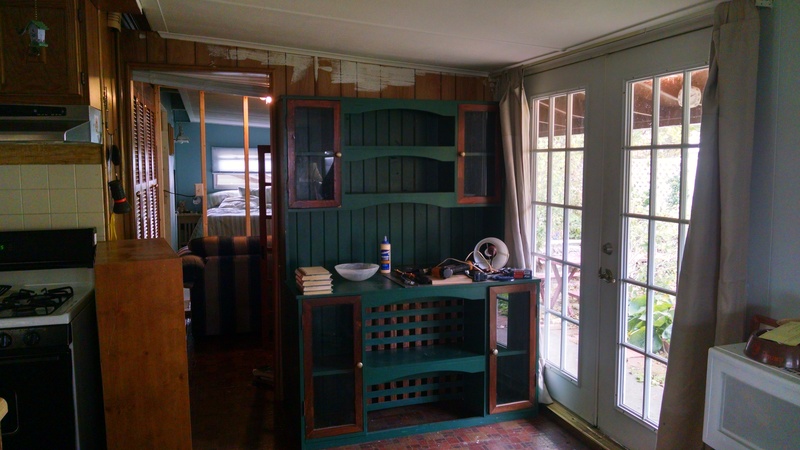 The hutch needs painted, too… the painting NEVER ends around here! So, now that little nook will hold the dining room table and the hutch, while the love seat (which has only been used as a clothes drop in the bedroom), got moved where the dining room table was (and so did the big bookshelf). It’s already improved the flow of the house. 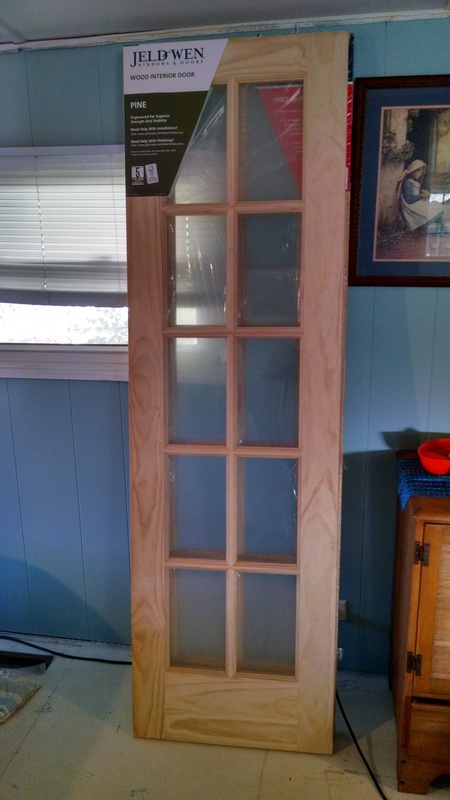 Plus, now the hutch isn’t blocking half the French door, letting in more light. Standing in the bedroom looking at the new dining area. 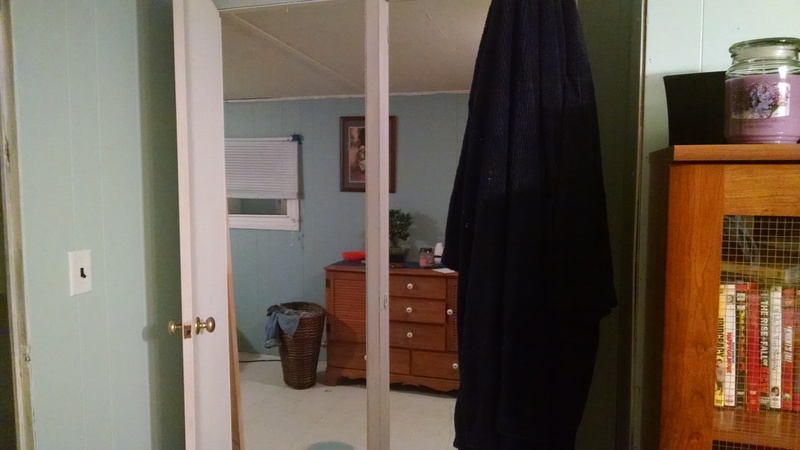 The closets on the right are the current bedroom closets. 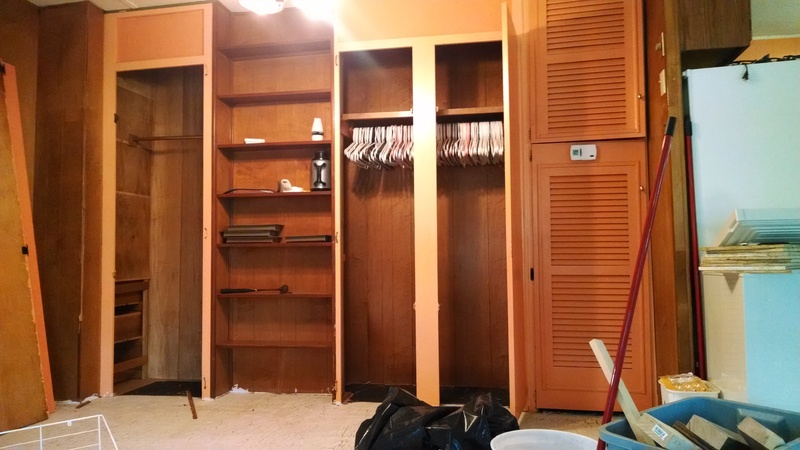 Eventually, when we redo the entire back half of the house – laundry and bathrooms – we’ll build a master closet. For now, clothes will be stored in the weird back closet and back bathroom-that’s-not-being-used-as-a-bathroom-because-it-doesn’t-work-and-it’s-super-tiny-and-cramped-anyway. That whole closet area that you see is going to turn into the most awesome pantry/kitchen storage area that I’ve ever had, and I am super stoked. …now the new sitting area! Also pictured: Bookshelves I should be filling right now and Tom’s ridiculously huge plant. So yes, busy week! I really like the way things are coming together. 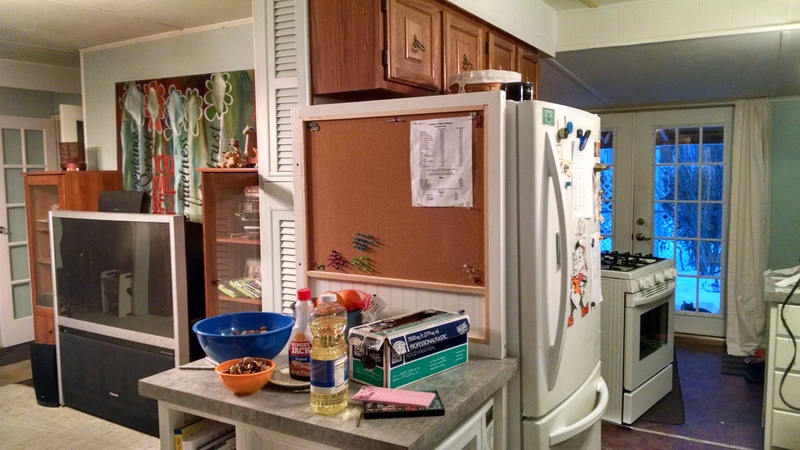 Hopefully soon we’ll sketch out our final (ish) kitchen layout, because that is where we are headed next – woohoo! So the last month has definitely been a busy one, but mostly with little projects and much puttering. 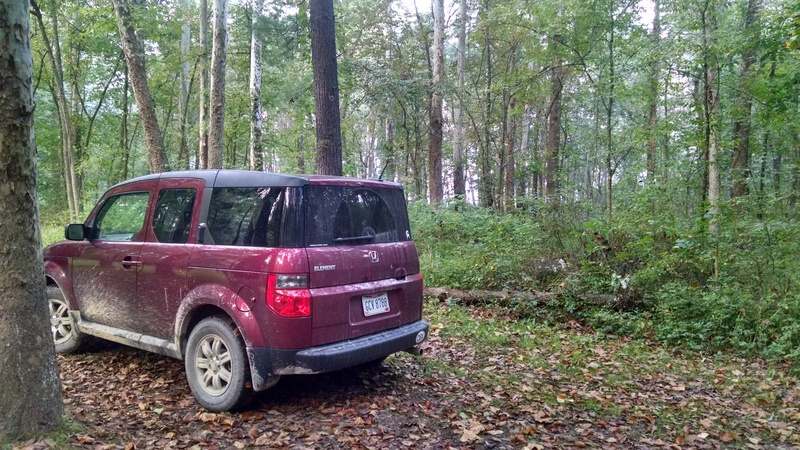 For two weekends in September, we spent a lot of time outside enjoying some much needed R&R. For the first, we were mostly local. 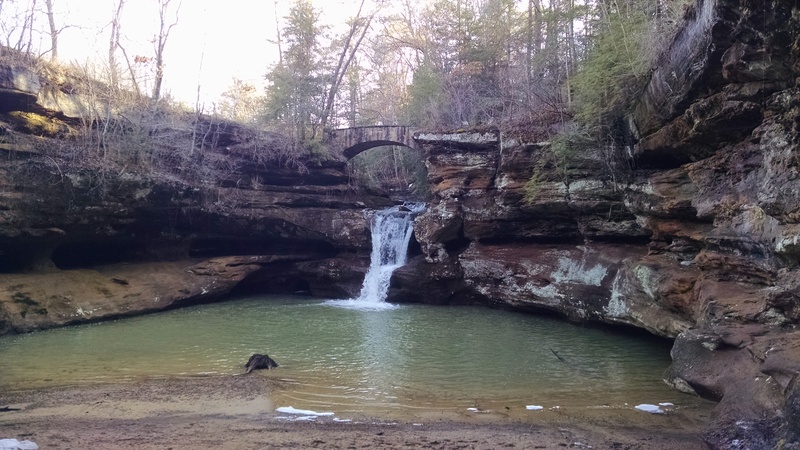 We live close to a section of Wayne National Forest, so we’ve been exploring trails and forest service roads whenever we get some decent weather combined with spare time. 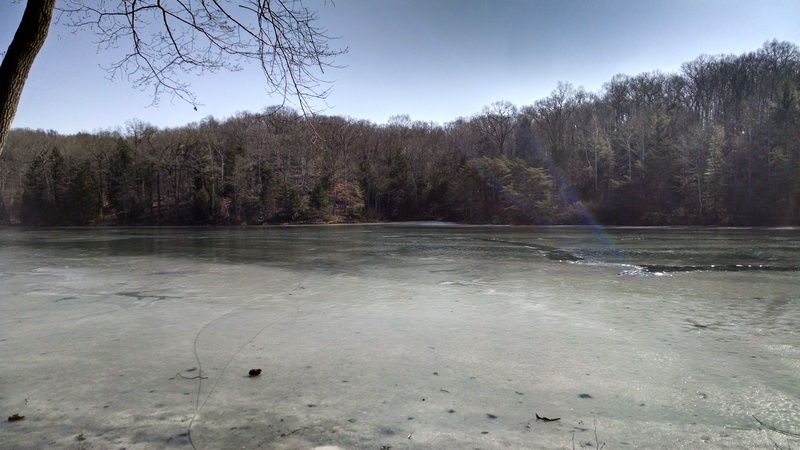 Pruitt can attest to our adventuring. 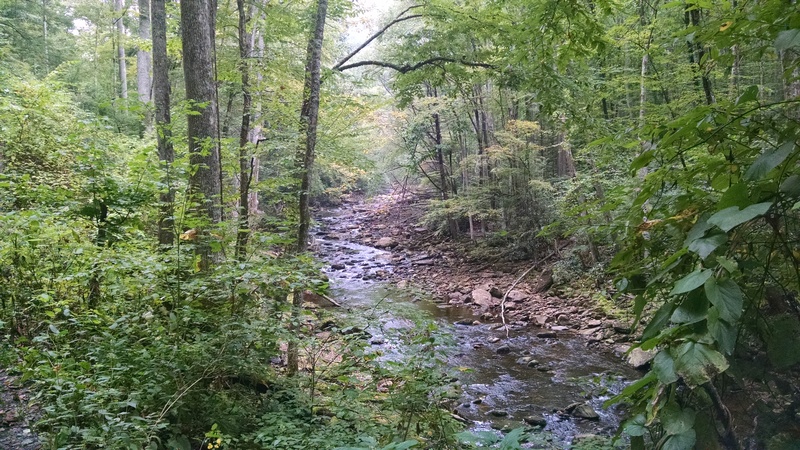 The second weekend we headed to West Virginia and backpacked a section of trail along Otter Creek. The trail followed an old rail bed, so it was fairly level and easy to follow, although it did involve some creek fording. It’s a super happy creek. We definitely want to go back there again sometime. Back home, projects have been tooling along. The biggest change since my last post is definitely the walls. Some of you will remember that during the July flurry of pre-move-in-madness, we painted everything white – ceiling, walls, and floor. 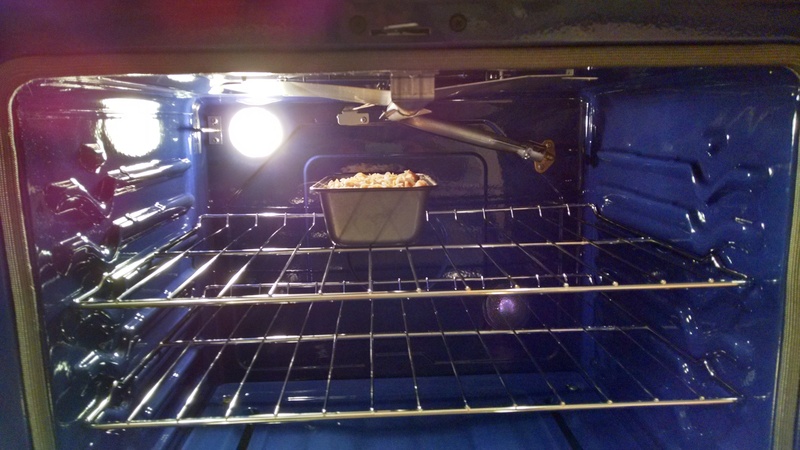 While this definitely made the house lighter, cleaner, and larger, it was a bit… sterile. I spent a LOT of time agonizing over colors, especially since our ever-more-open floor plan means that you’ll almost always be able to see two rooms’ worth of walls at a time. I’m feeling a tad overwhelmed. In the end, we trended towards light, cool colors. The lower room got painted pale green in August (Pale Moss Green to be specific). I really want to post pictures of the colors, but we’ve been getting our paint at Menard’s and their website is really terrible when it comes to showing colors, but it’s 10C-2 if you happen to be at Menard’s and want to look. 😀 I think I also already mentioned that all the trim throughout the house is Dutch Boy’s White Lullabye (actually, I’ve been getting all Dutch Boy paint, even the Menard’s colors). For the upper level of the living area, we went with a mid-grade blue, Cosmic Rays. It’s a slightly greenish-blue, so actually looks really nice against the green of the lower room. For the bedroom, I used the darkest color on the same blue card, Colonial Aqua. I was afraid it may be too dark, but it’s actually perfect and I love it, even in our small bedroom. Eventually, the bathroom will be the palest blue (Pistachio Cream) and the bathroom will probably be the darkest green (Quaking Grass), but that’s all in the future. Here you can kind of see the blue and green together. My house, while it feels light, is kind of dim for taking pictures, so the colors don’t show up terribly well. Trust me, it looks great. Because yes, we still have walls to take down/move about. Actually the wall above is probably going to be the next big project. We’re planning to move it back about to where the dresser and love seat meet, making the bedroom much smaller, and turning that end of the room into a dining area, since straight through the pass-through is actually the kitchen. 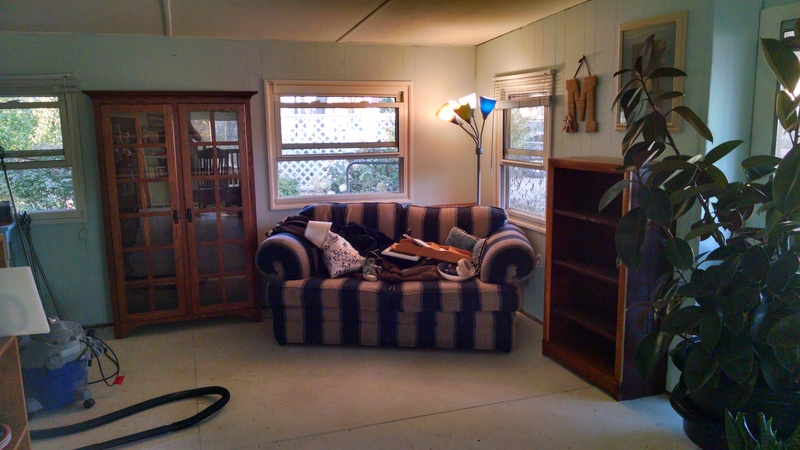 We’re still playing with a lot of ideas to try and utilize the space we have, and that spot, despite the love seat, is really just dead space for us. 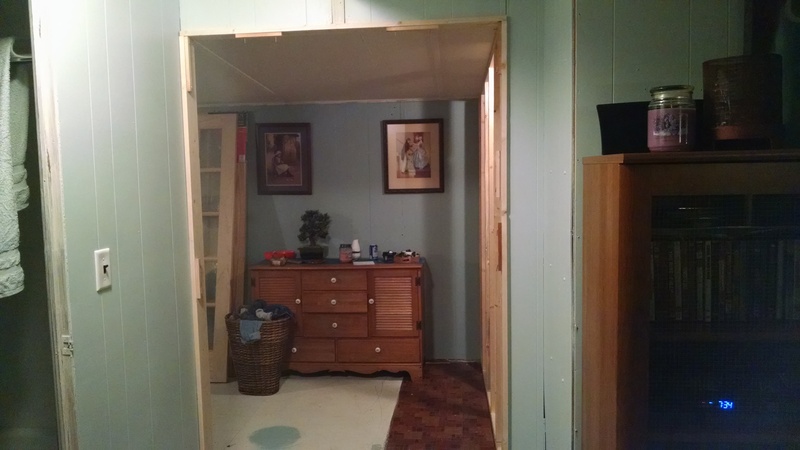 Currently, the main bedroom closets are there on the right. We’re planning to leave that closet area, but put shelves in it and use it as a pantry instead. The bedroom closet will probably be on the new wall. Last weekend we also spent some time carefully drawing out our current floor plan. And by “we”, I of course mean Tom. The plan is to get this laminated, and then we can draw on it with dry erase markers and try to figure out how we want to configure the back end of the house. The back closet/tiny bathroom that doesn’t work/laundry room/current bathroom area is going to somehow all be combined into one bathroom/laundry room of awesomeness once we figure out how we want to make it work. 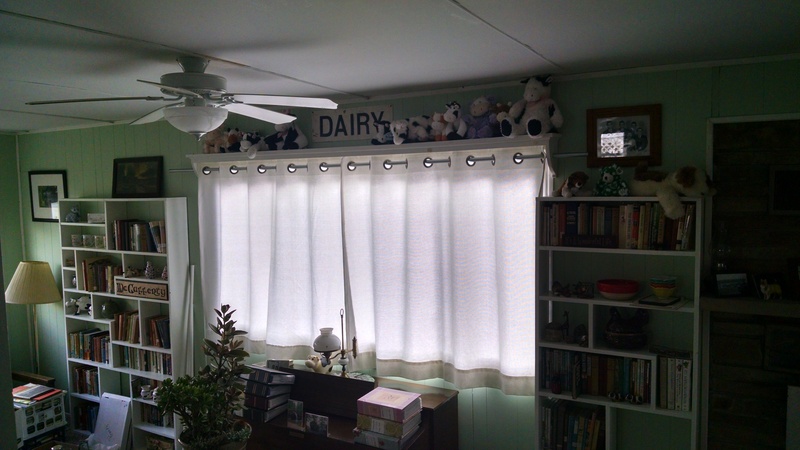 One other project to update – super long curtain rods. 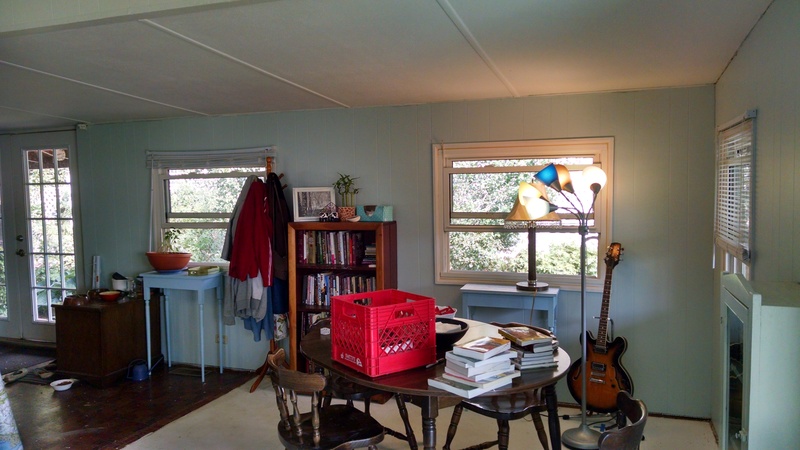 In the lower room, we have two windows that are 8′ across, and two that are 7′. Grandma has volunteered to make the curtains, and we’ve actually purchased the fabric. However, she has been patiently waiting for the rods to go up so she could finish the curtains. The problem, of course, is that curtain rods that long are ridiculously expensive. 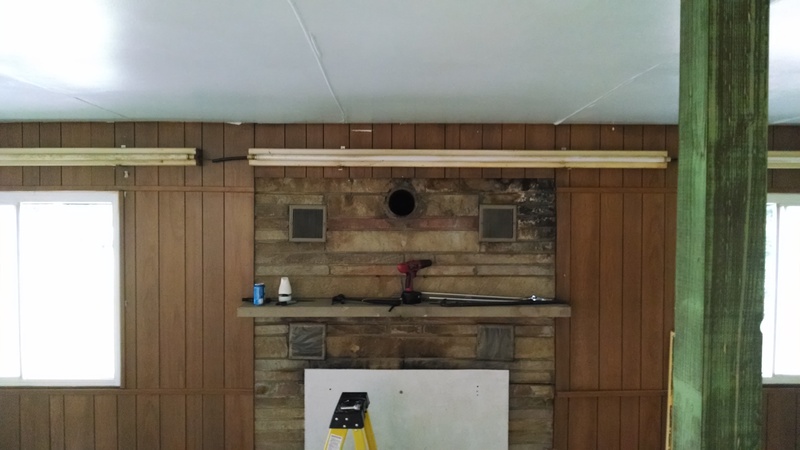 Originally, we tried dowel rods. However, we couldn’t find them longer than 8′, and we need some overhang. 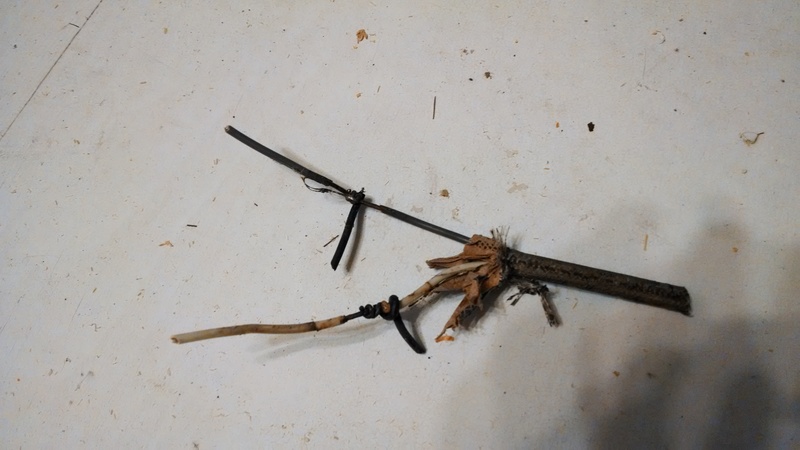 Tom tried piecing them together to add the extra part we needed, but it weakened the rod too much. 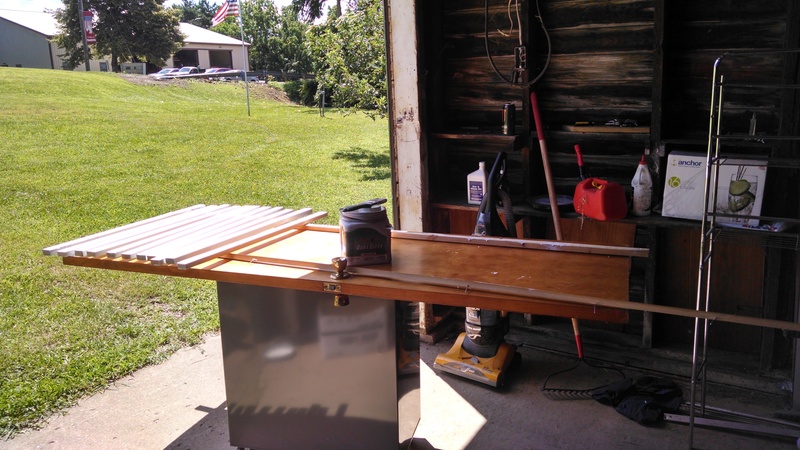 Last weekend, we went with a more viable solution – conduit. The other reason the project has taken a bit of time is because Tom wanted to build the shelf unit you can see holding the rod in place. It looks even nicer close up. 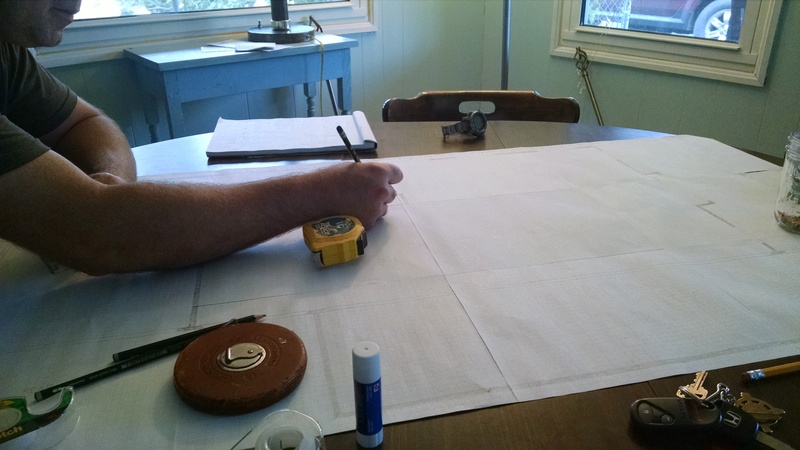 Eventually, we’ll trim off the ends of the rods and Tom will probably take them to work and paint/bake them (he’s an automotive refinisher), but for now I think we’re finally ready to call Grandma and get those curtains up! All in all, things are coming together. It’s still really small steps, but they’re small steps forward. Meanwhile, the bank account is recovering so we can get ready to hit the next big-money project – the kitchen. 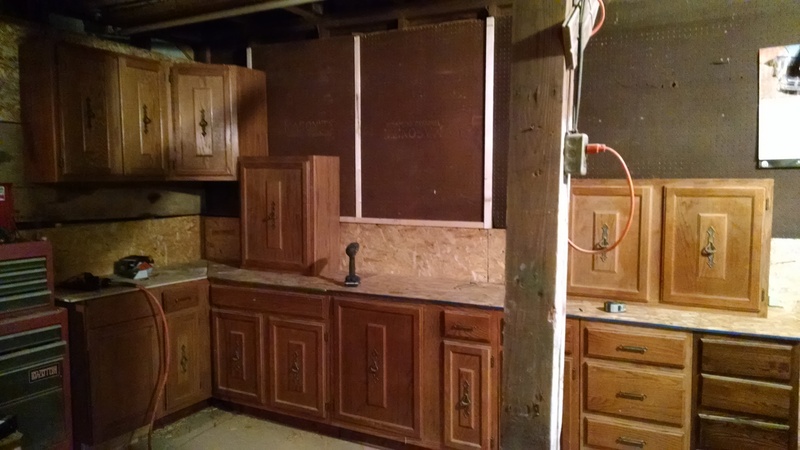 *cue dramatic music* That’s going to involve a lot of wall-moving and new cabinets/countertops (any suggestions for DIY in those areas would be appreciated!). 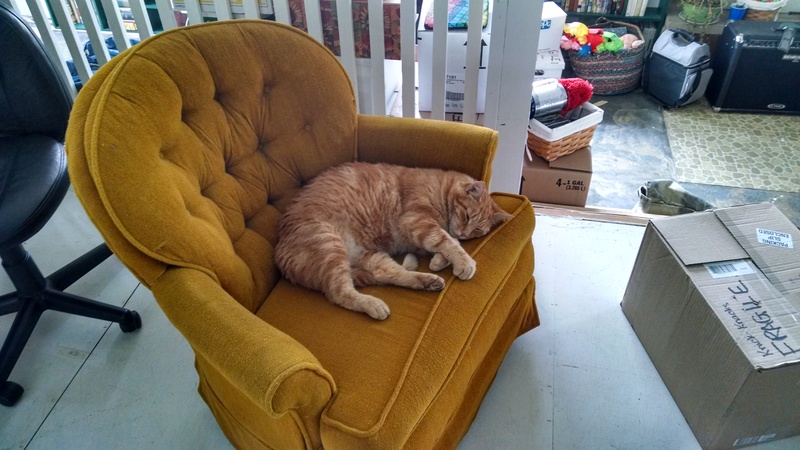 The last few weekends have been busy with circumstances beyond our control, but things seem to be settling back down, and I think we’re heading into another weekend of puttering (trim and organizing/unpacking, most likely), so life is, as always, very good. So the last few weeks have been full of easy puttering. After the intensity of the pre-move, we were so relieved to be out of the apartment and living in just one house. It’s been so fantastic to just come home and be home and also be where we can work on stuff if we feel like it. But, truthfully, we haven’t been doing a lot of work. Basic unpacking and puttering, and a lot of resting and being happy about not being moving any more. 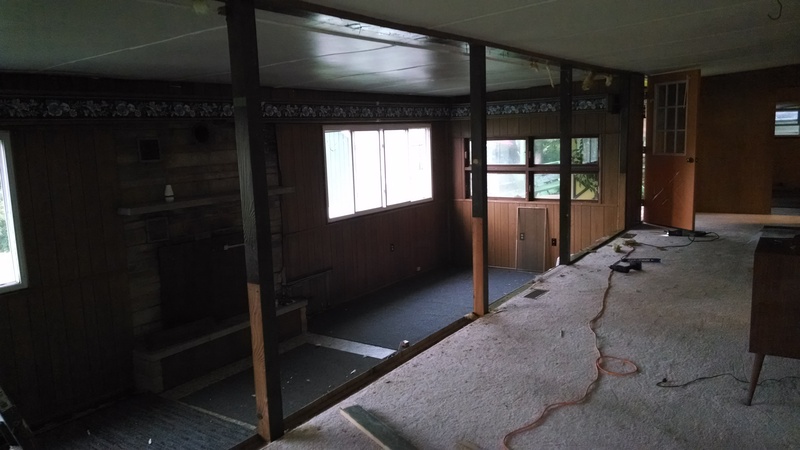 Just when things were starting to feel settled in, we decided to get started on the lower room. This room, in case you’ve forgotten, has the weird flooring situation – concrete with a strange black powder that appears to be leftover carpet padding. 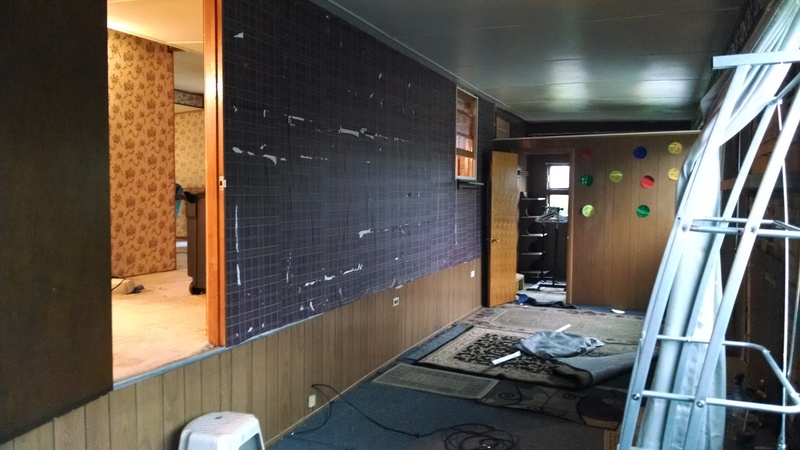 We’d like to do the flooring in this room, but of course need to finish the walls first. After loads of agonizing I finally ended up with Menard’s Pale Moss Green (10C-2 if you’re interested) for the walls of the lower room. The upper room (main living area) will be blue – Cosmic Rays (57C-2), while the bedroom and laundry room will be the darker shades on the blue and green cards respectively. The trim and shelving throughout the entire house will be white (slightly off from true white, but pretty much white), White Lullaby. Hopefully everything will flow alright, and the white will tie everything together. For now, though, we’re just focusing on the lower room. This room actually needs a lot of work yet. We’re starting with painting the walls, railing, and the shelves we already have (more on that in a bit). 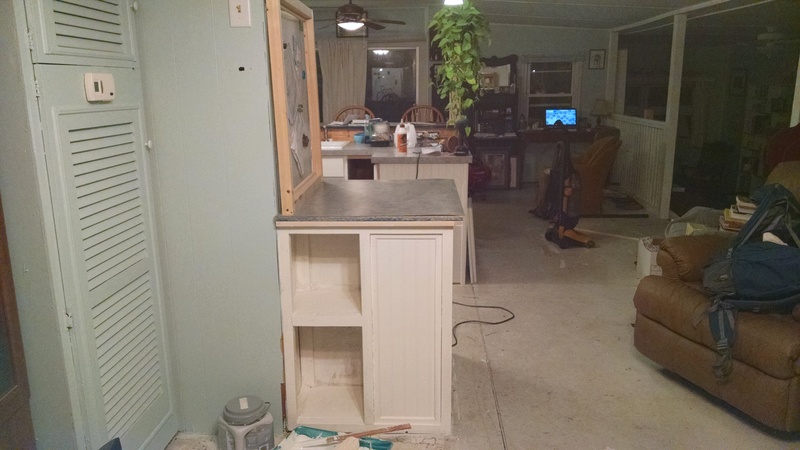 Then we’re hoping to do the flooring (still agonizing over whether to attempt wood laminate or just go with the carpeting because of the floor’s unevenness). Then we have more shelves to build, plus Tom has plans for a big desk/workspace at one end, plus I’ve been promised a window seat, about which I am ridiculously excited. 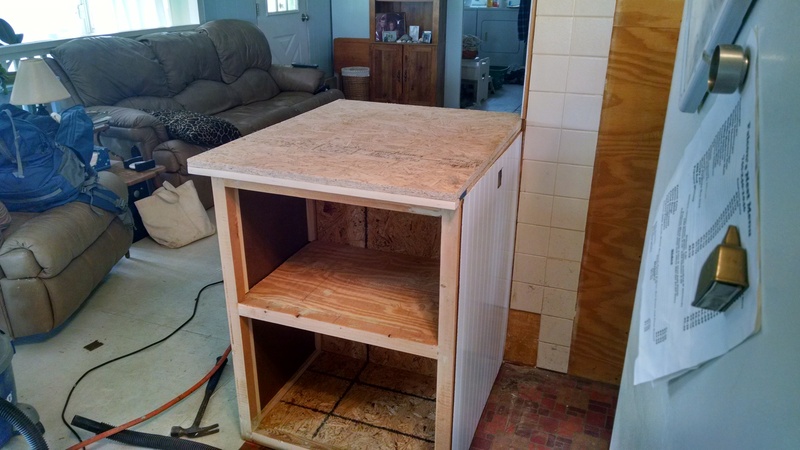 So, first step – shelves. Tom and I have lived in several houses since we’ve been married. 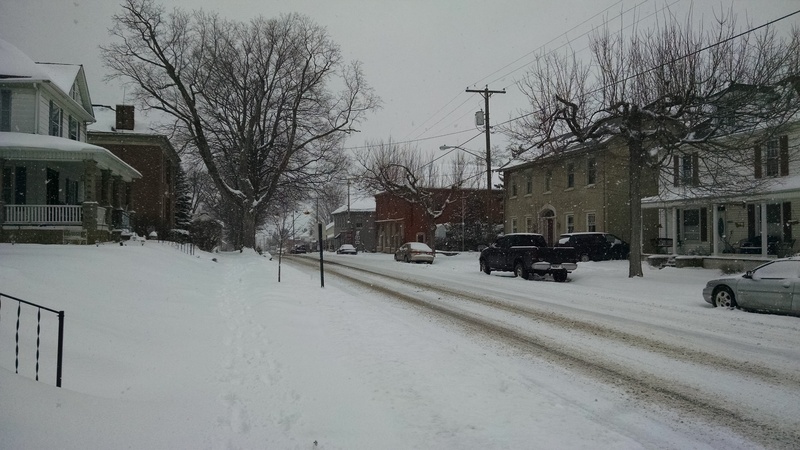 We started at the Wilson Avenue house, and then moved to the brick house. From there, we moved next door into the yellow house (collectively, we lived almost two years between those two houses – same landlord – and refer to those years as when we lived “on the hill”). Last year, to save money to buy a house of our own (it worked!) we moved to the Broad Street apartment. Point is, at every stop Tom has built me shelves. I have about a thousand books, so shelves are a critical part of my life. We reached a high point in shelf-building at the yellow house. That house a long, wide hallway, and Tom built shelves to run the whole length of it. 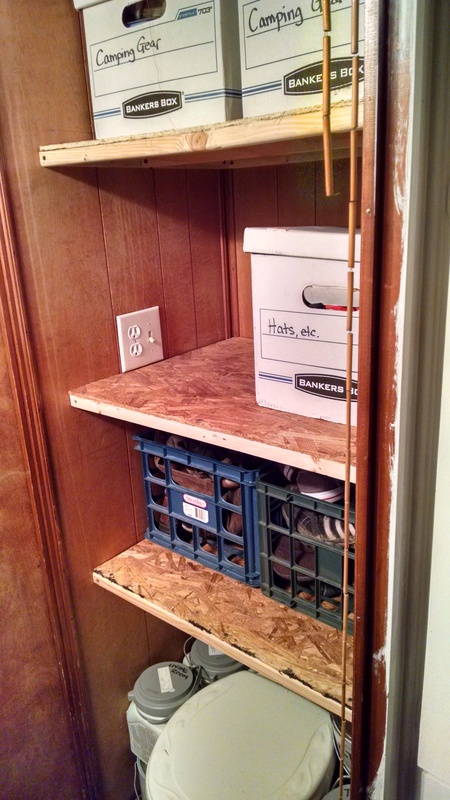 I had seen a picture online of shelves that had, instead of just straight shelves across, lots of little nooks and crannies. He did a fantastic job building these shelves, and I LOVE them! 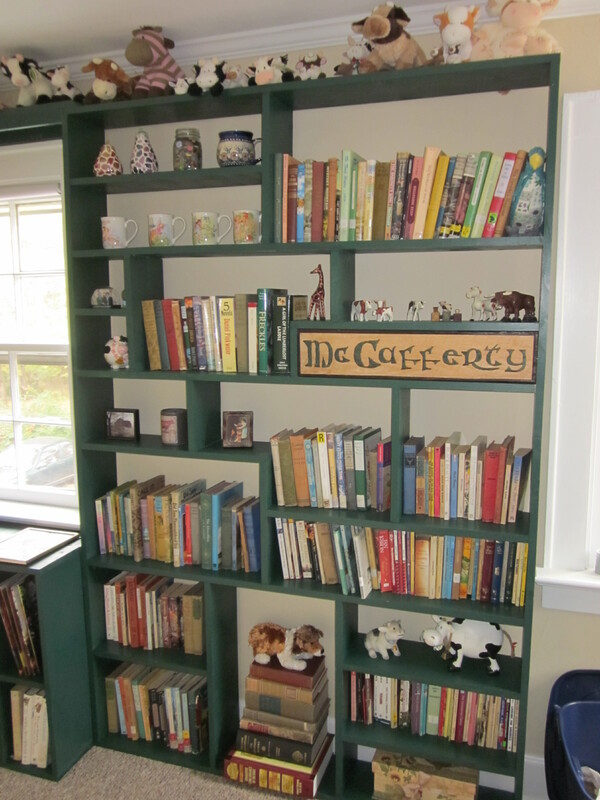 The shelves at their original location in the yellow house. 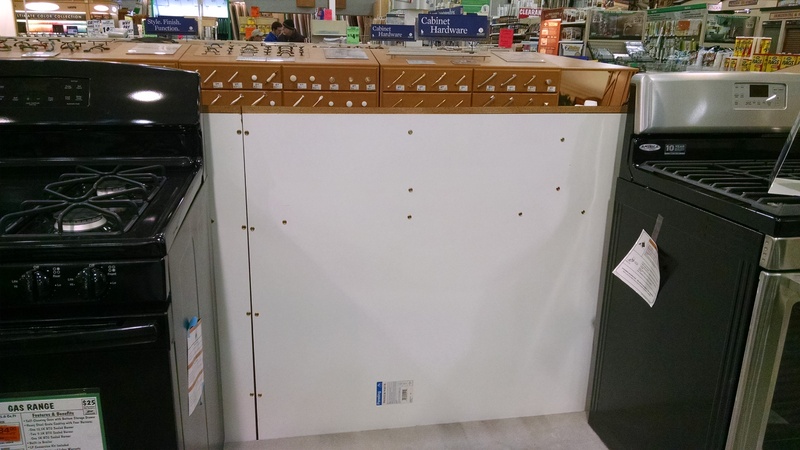 Also, pro-tip – if you’re building shelves, especially ones like these with lots of little squares and whatnot – paint the boards first, then build the shelves. You will save yourself so much hassle! Tom has finished building the other two sections of railing. I think I mentioned before that we’re building these completely out of 2x4s, cut to length and then split in four, meaning each section has cost us less than $25. While not the fanciest railing ever, the simplicity works for our situation, and they actually don’t look too bad all painted in white. Nice mission-style railing at a super reasonable price! We painted the spindles before installing them (you can see the bundle there on the left) – way easier than painting them afterwards!! 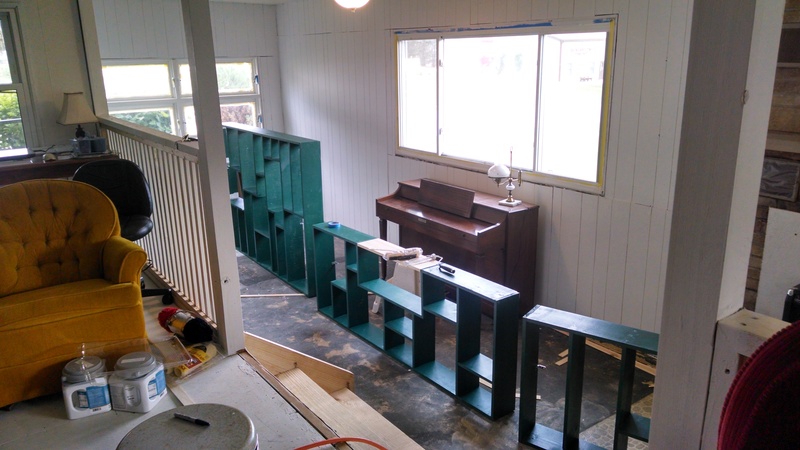 Yesterday and today we’ve been putting the walls in green, and finishing up painting the rails. (Actually, Tom’s painting the rails right now while I’m goofing off on the internet. :-D) It’s pretty exciting to have something not white going on around here! Poor lighting, but you can kind of see the green! The two smaller shelves are going on either side of the fireplace, with the window seat under the window on the right, and the piano – surrounded by as-yet-unbuilt shelves – under the window on the left. The other exciting news around here is that Clarence has officially moved in as well. We’ve really missed our super fat, super furry friend. 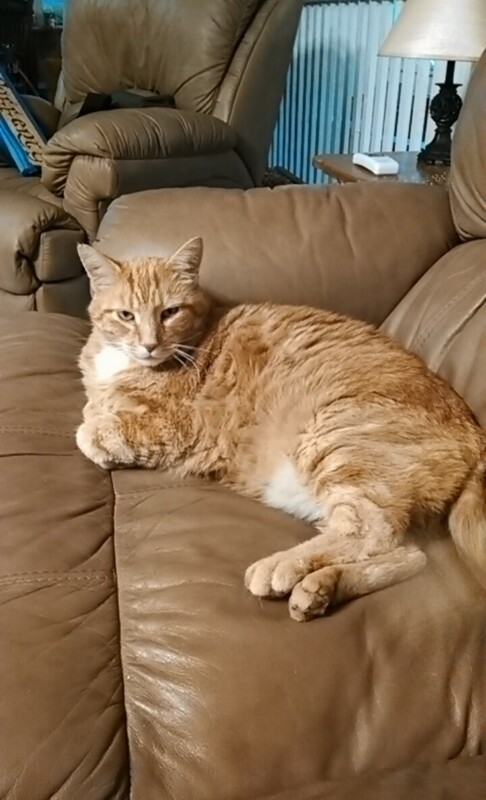 Don’t let the ‘tude fool you – he’s thrilled to be here. There have been other minor changes as we’ve been settling in and seeing how things work for us here. Getting the lower room squared away is going to help a lot, as a lot of our storage will be down there (and I’ll be able to get my precious books out of boxes! ), so we’re looking forward to that. For now, I’m off to do some more painting – maybe tomorrow will see the second coat!!! The man who built our house, and Pop’s, actually, was a fellow by the name of Murphy. Apparently, Murphy didn’t have a strong belief in things like safely laws or common sense, and there is a LOT of sketchy wiring/plumbing/everything in our house. It all gets blamed on Murphy, and this week we’ve spent a lot of time cleaning up his 40-year-old messes. So Tom has had this week off of work, and boy have we been busy. The only blessing that the fleas have brought us is the fact that we aren’t living here yet, which means that the huge messes we’ve created this week have been scattered on subfloor and not carpeting and/or furniture, so that’s a plus because there has been sawdust E V E R Y W H E R E.
I love my lack of wall! In the picture above you can see this sort of floral wallpaper going around the top of the wall. Those are actually boards, and behind those boards were florescent lights. I hated everything about this set-up (again, wallpaper should never be shiny), and was thrilled when it became the next step in renovating the room. 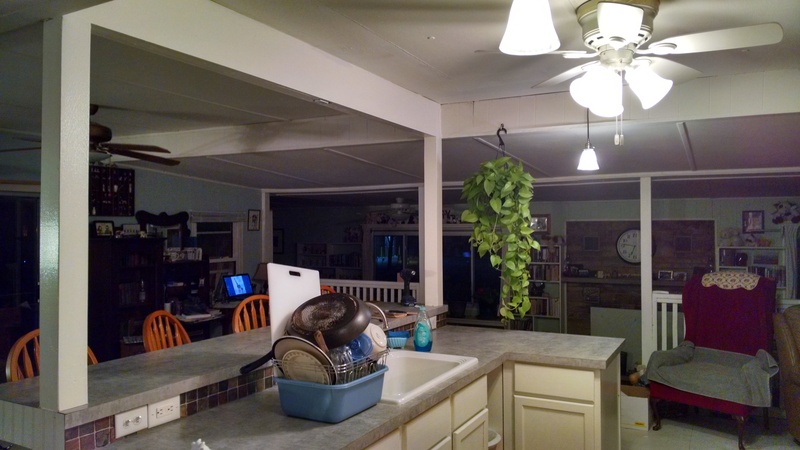 We really wanted to replace those lights with two ceiling fans/overhead lights. However, this meant a lot of wiring and complications that I don’t really understand. Luckily, Pop was around to lend a hand. 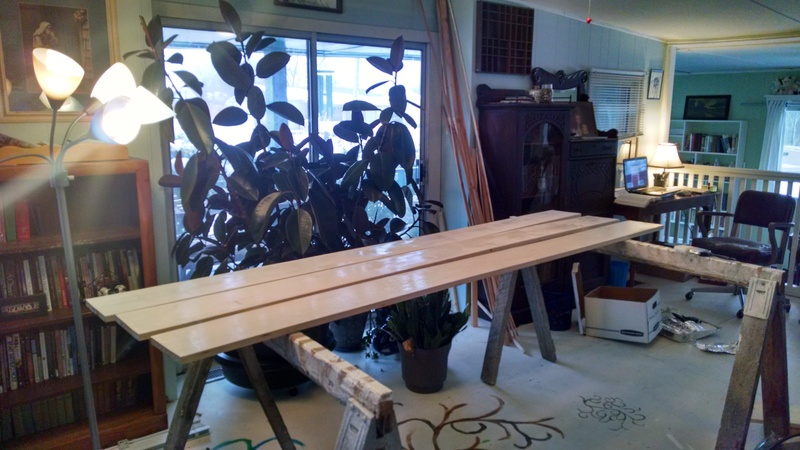 First, Tom took down the boards (which, in a house built out of particle board, turned out to be really nice solid wood planks – we’re definitely recycling them into shelves!). I personally thought that even the bare florescents were an improvement! Then the lights had to come down as well. This is how everyone spends their anniversary, right?? After that, the fun began. 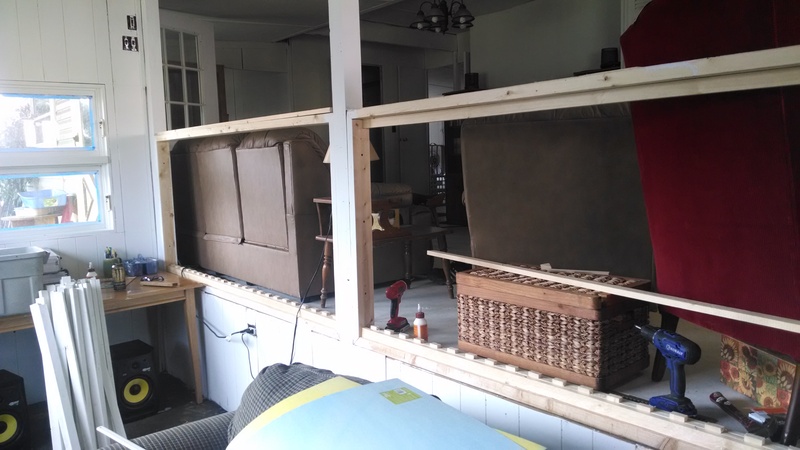 I was actually busy working on another project throughout the day – between the main and lower floors, we are building a railing. It’s a really simple one. We’ve created the spindles by splitting 2x4s into fourths, making a simple but decent-looking mission-style railing. So guess who spent the day painting?? As you can see, I cleverly arranged my painting table so I was painting in the shade but my spindles could dry in the sun. I’m brilliant! 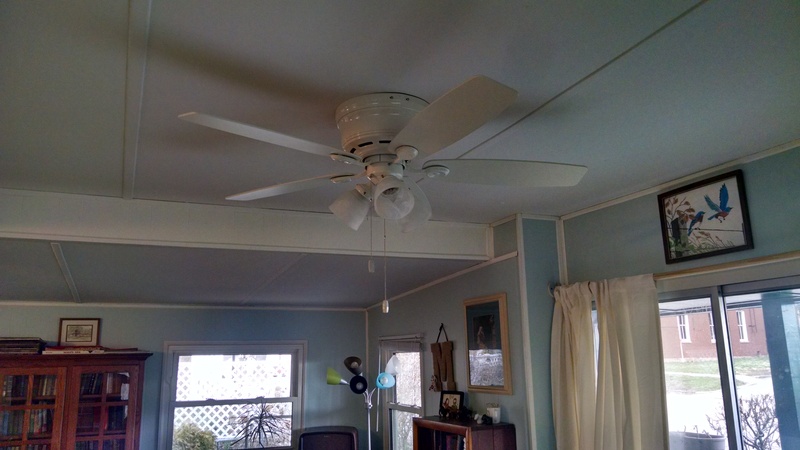 There was a lot of work that went into putting in the ceiling fans, but I wasn’t really a part of that so, in my mind, it was basically magic. Words can’t really express how completely thrilled I am! 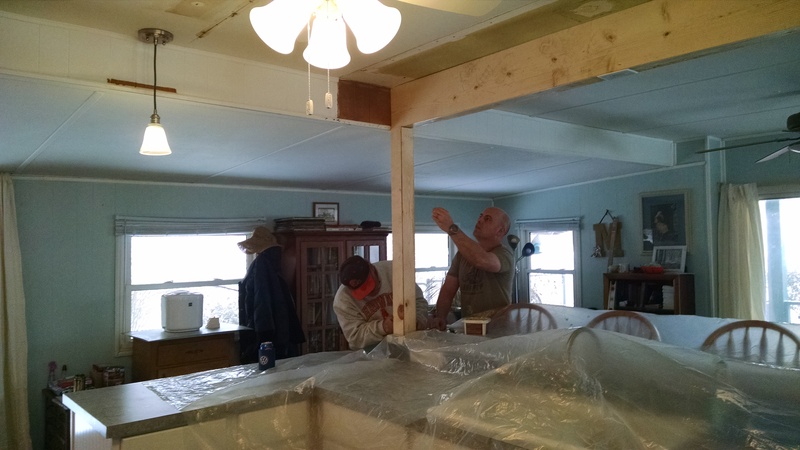 The next day, while I was at real work, Tom and Pop crawled under the house and redid all of the wiring to that lower room. I’m not really cognizant of all the details, but apparently when Murphy stuck this addition on he decided that he could run all those lights, a fan for the fireplace, and about eight outlets by splicing a wire off the main electric to the main part of the house. He didn’t bother using electrical tape or to ground anything. 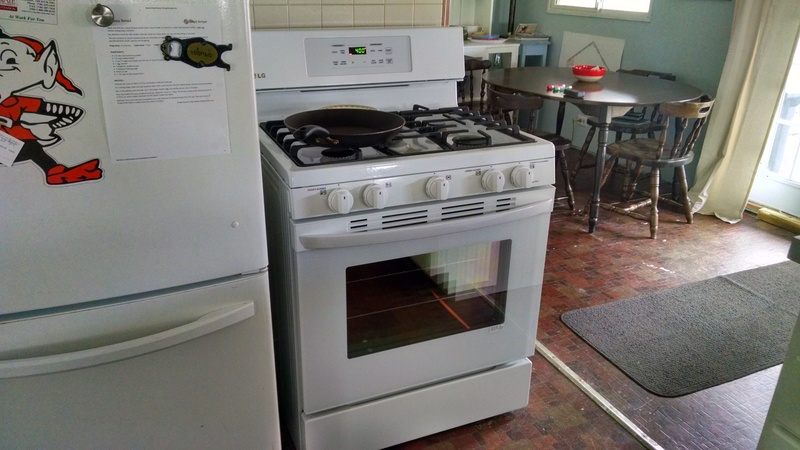 Why this house didn’t burn down years ago is one of life’s little mysteries. In the end, though, I have awesome lights and outlets that actually work (and shouldn’t catch my house on fire). We’ve also still been painting like crazy AND Tom got rid of some closets (because we don’t really need closets in the living room) which has opened things up even more. We’re going to treat for fleas again tonight (even though we haven’t seen any) and hope (and pray) that this is the last time, because we really have to move next weekend! 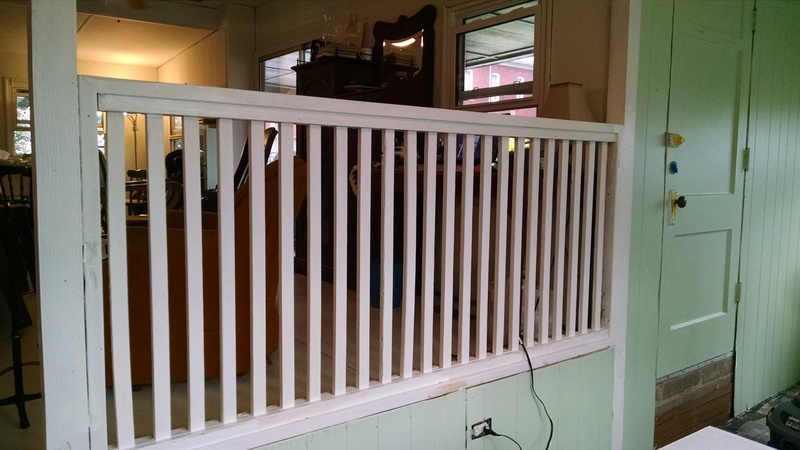 Mostly complete section of railing, built entirely from 2x4s for a total of about $25. First coat of primer downstairs!! 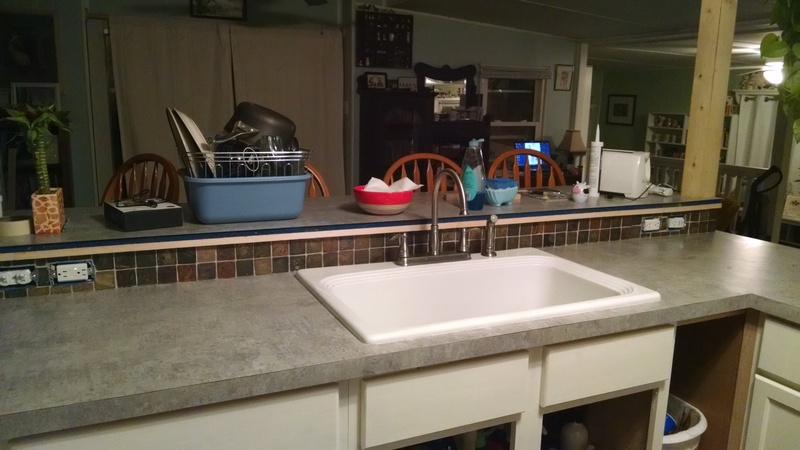 …and after. 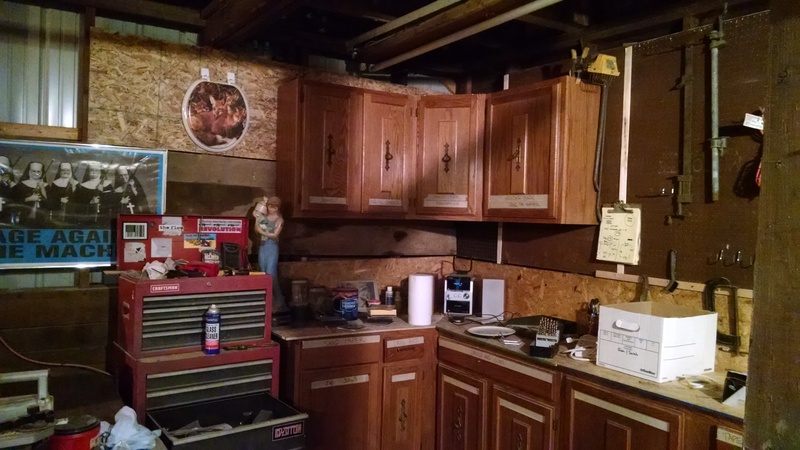 Slightly different angle, but you can see where we kept the furnace closet on the right in both pictures. 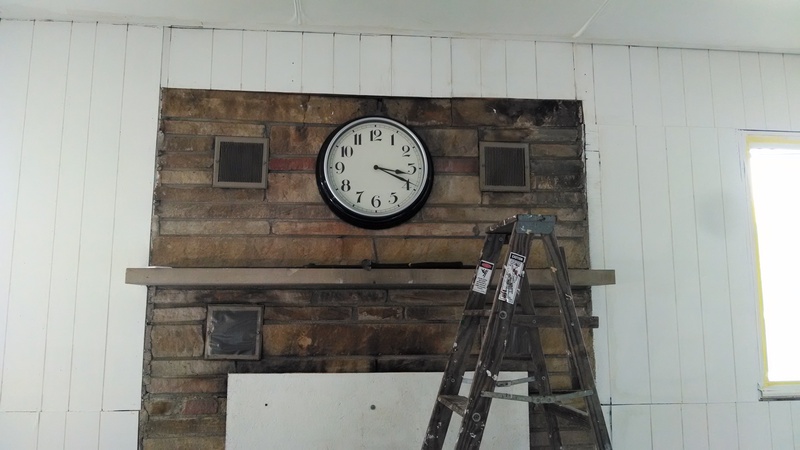 Clock above the fireplace makes us feel like we’re making progress in the move. So we debated a lot about what to do with the walls around here. 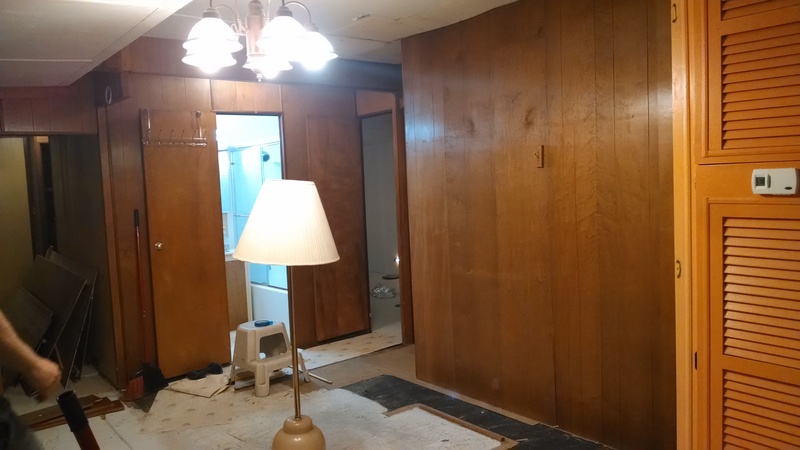 All of them are covered in paneling, most of which is extremely ugly. 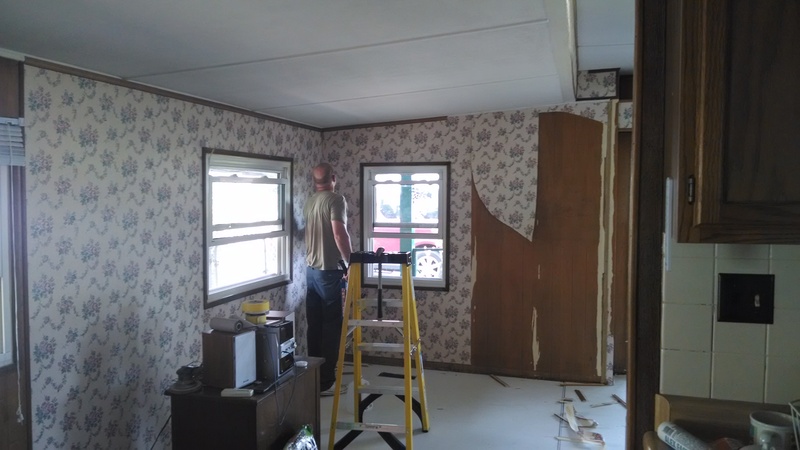 What’s not covered in paneling was covered in wallpaper that was even uglier (wallpaper should never be shiny). 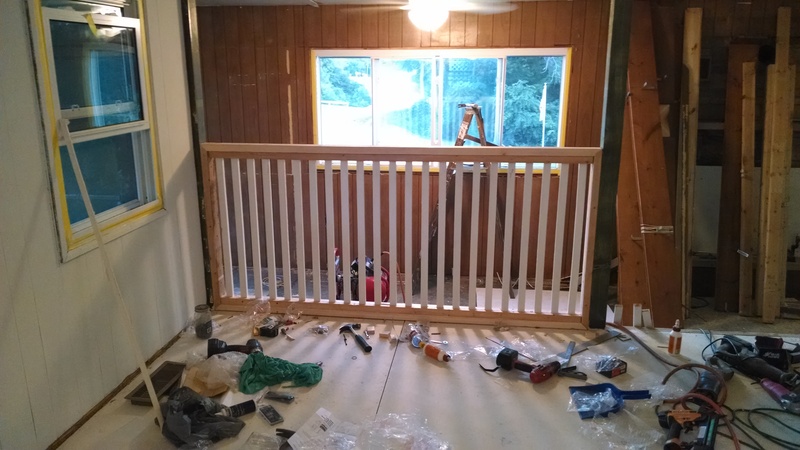 Initially, we talked about taking down all of the paneling and drywalling the entire house, but it was a daunting project, and one we don’t really have the funds or time for right now (and living in a house while you’re drywalling is quite miserable). 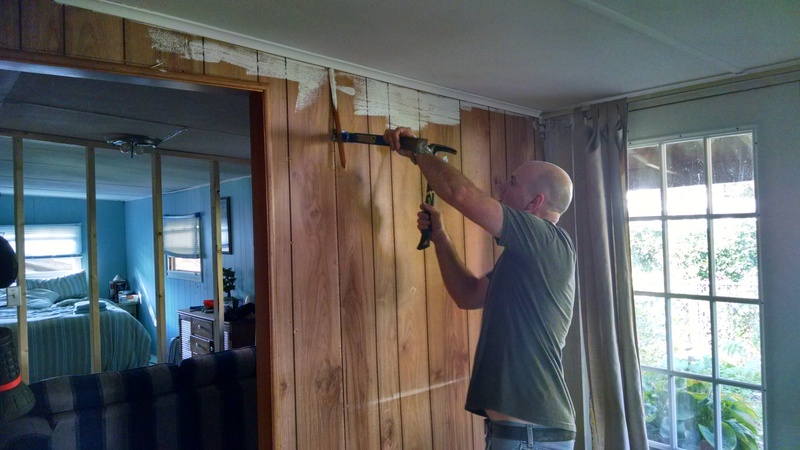 So, in the end, we decided to strip all the wallpaper but embrace the paneling by painting it. This has made a difference that we still can’t believe. 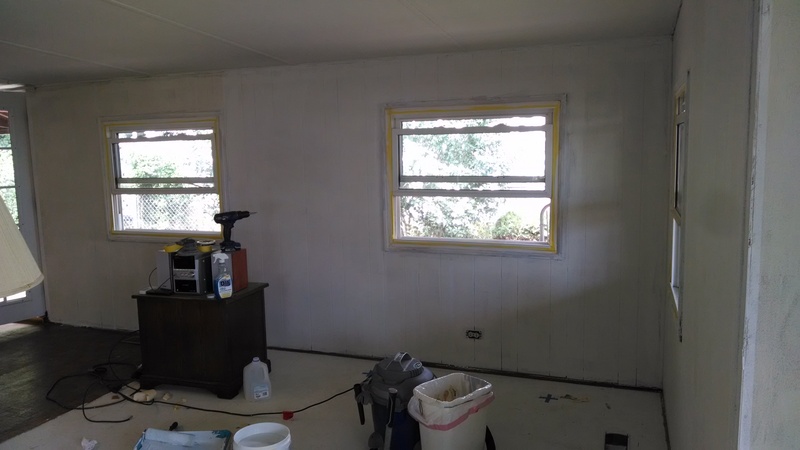 So far, we’re in the priming process, so all the walls are slowly turning white. It has brightened up the entire house and made everything seem bigger and more open. 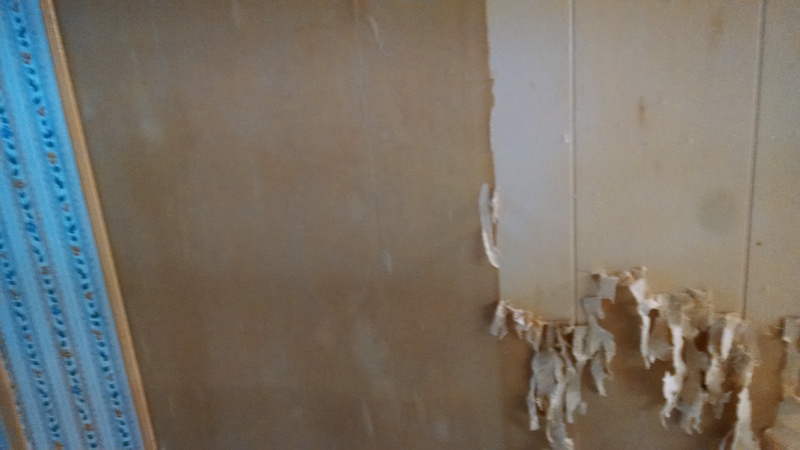 Luckily, most of the wallpaper came off fairly easily. 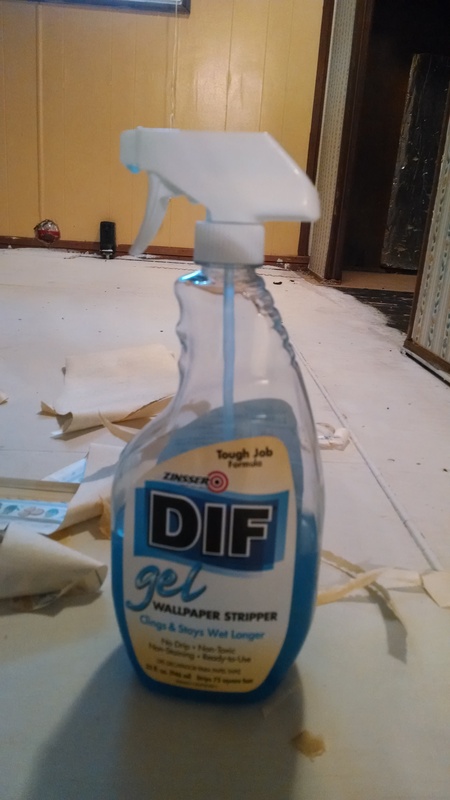 I thought this stuff might be a gimmick, but it actually worked brilliantly on the stubborn wallpaper. Agatha approves of our projects. Of course, Agatha approves of everything. She has no sense of discrimination. The walls are an ongoing project, but they are coming along. Tom has had this week off of work, and we’ve been working on this house like crazy. Hopefully tomorrow I can post about all the improvements we’ve made in the downstairs room – it’s like a miracle! 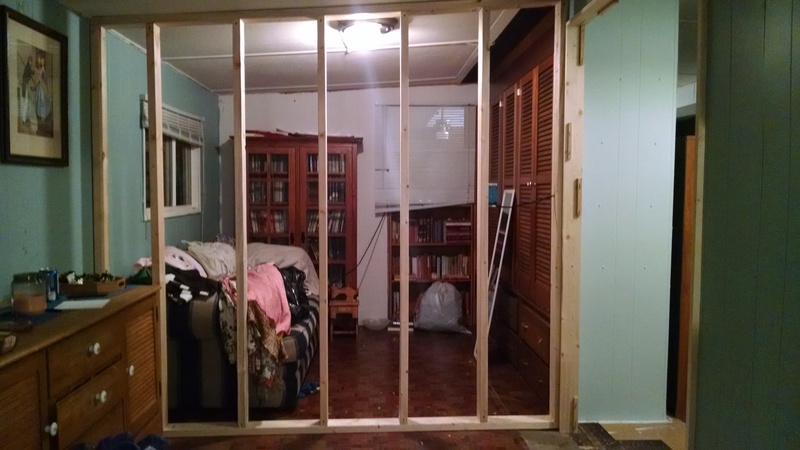 And just tonight Tom and Pop took out another section of wall, opening up the living room even more. It’s absolutely fantastic. 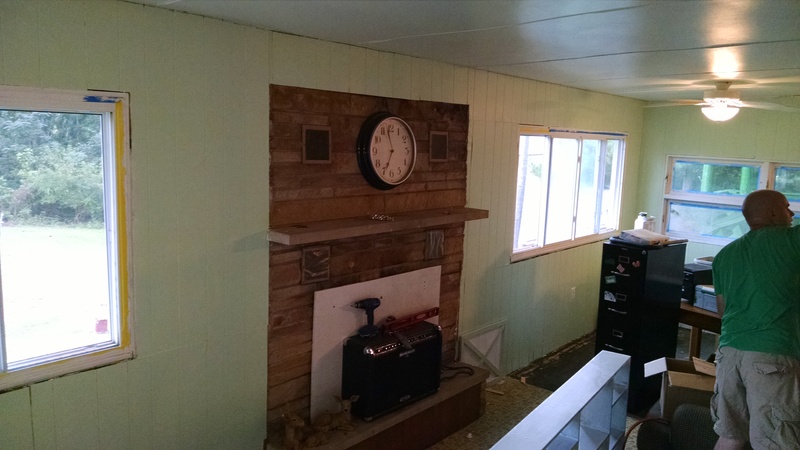 Of course, the big question (for me) is what color we’re going to paint all of these walls. 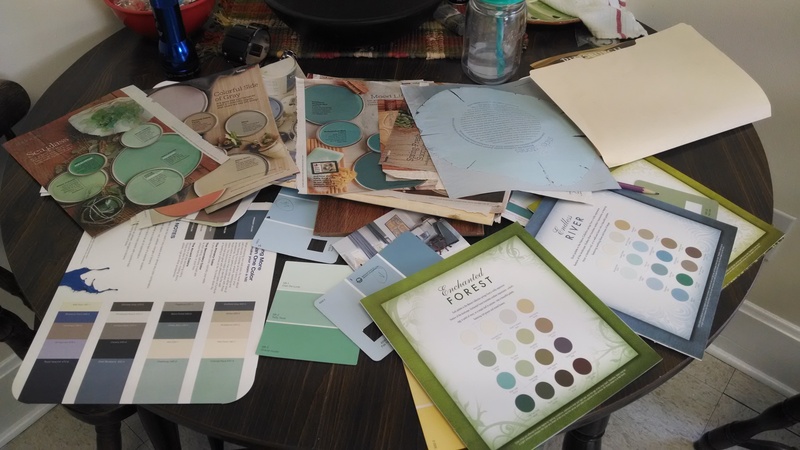 Right now I’m leaning towards blues, gray and white for the main living area, with maybe some aqua or green for the bedroom and laundry room, but we’ll see how things come together. Tom says we’ll make a decision once everything is in white – which could be as soon as tomorrow!! !